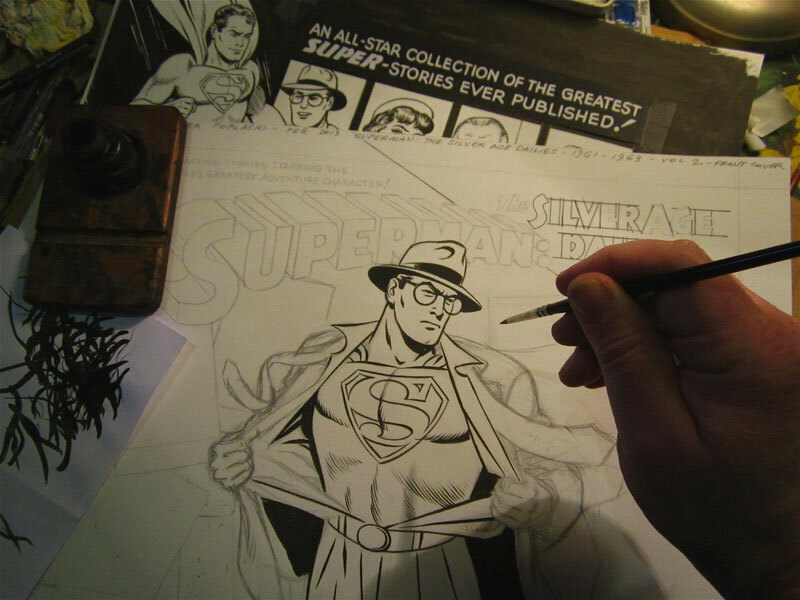 WORKING AWAY FOR THE GREATEST SUPER-STORIES EVER PUBLISHED ! 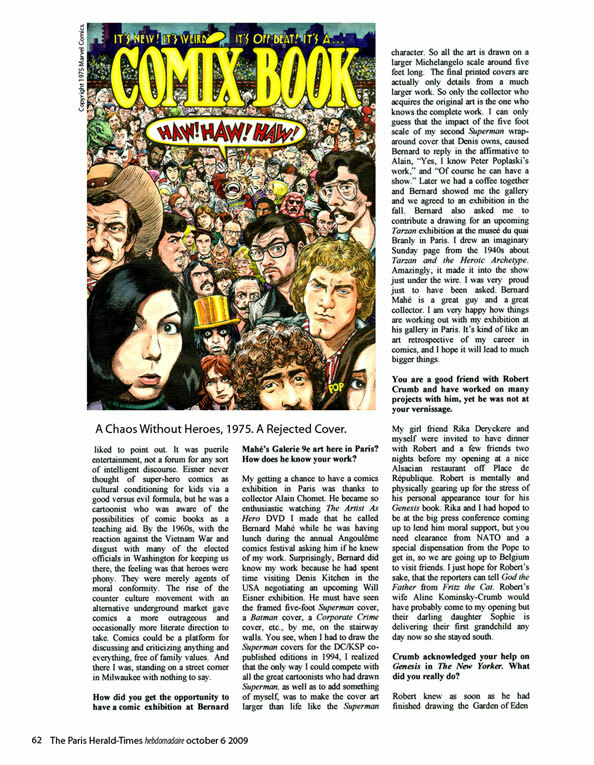 Click on the arrow at the bottom page to see the complete blog ! 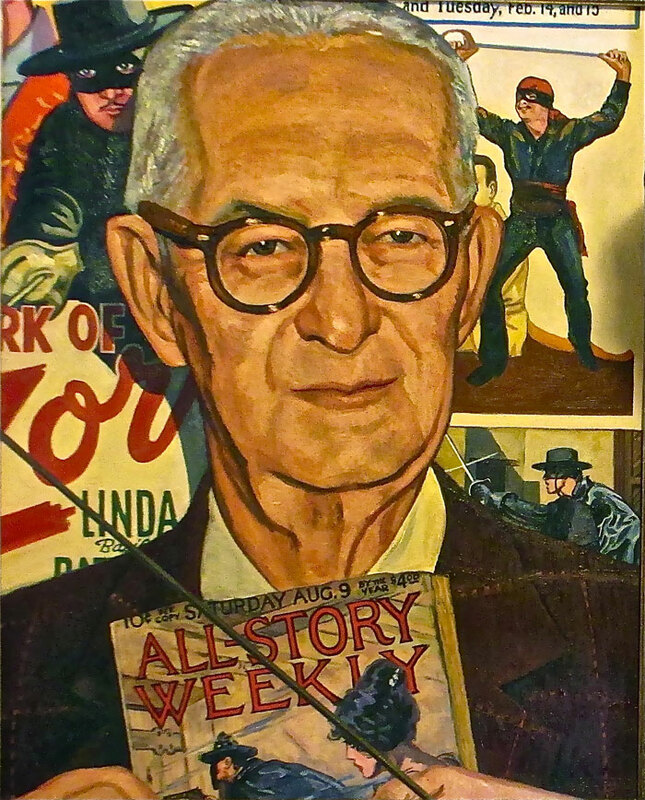 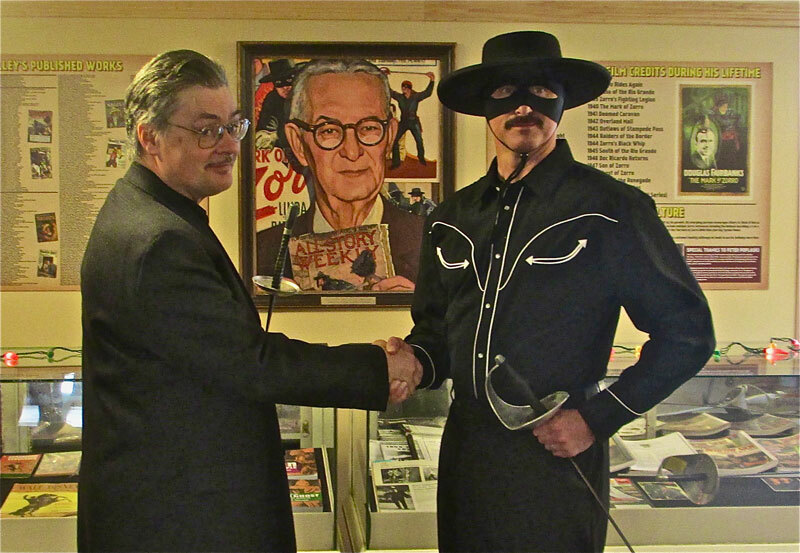 CHILLICOTHE, Ill.--The creator of Zorro was honored on Saturday by the Chillicothe Historical Society. 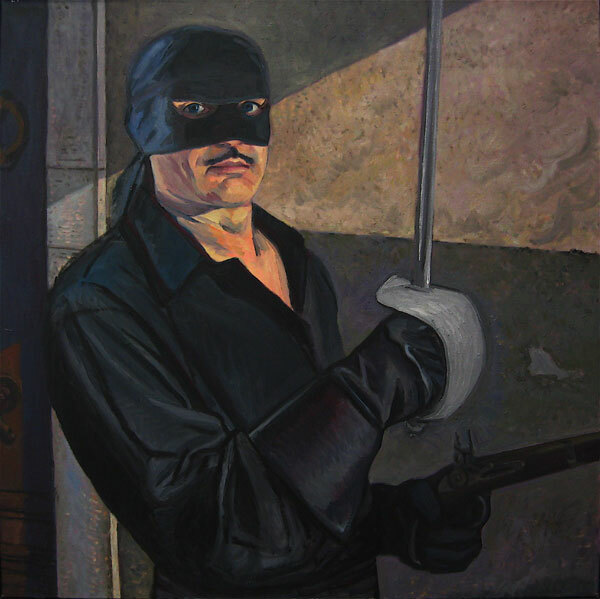 Johnston McCulley who graduated from Chillicothe high school in 1901, was the creator of Zorro. 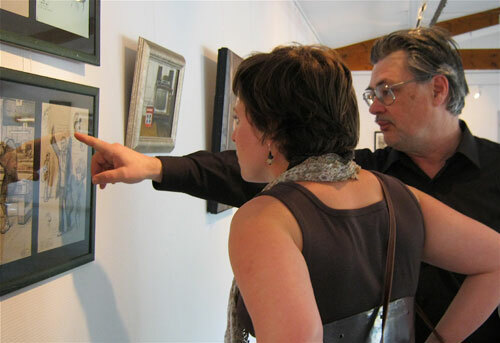 Saturday was the grand opening of an exhibit dedicated to everything this hometown hero accomplished. 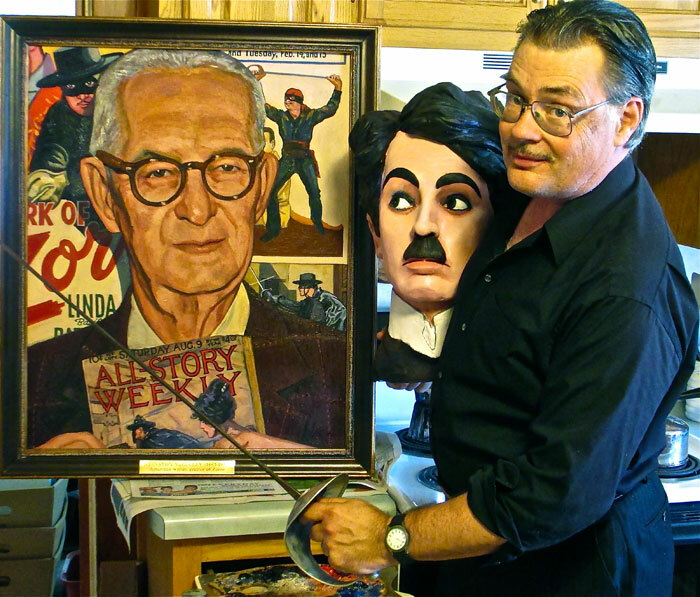 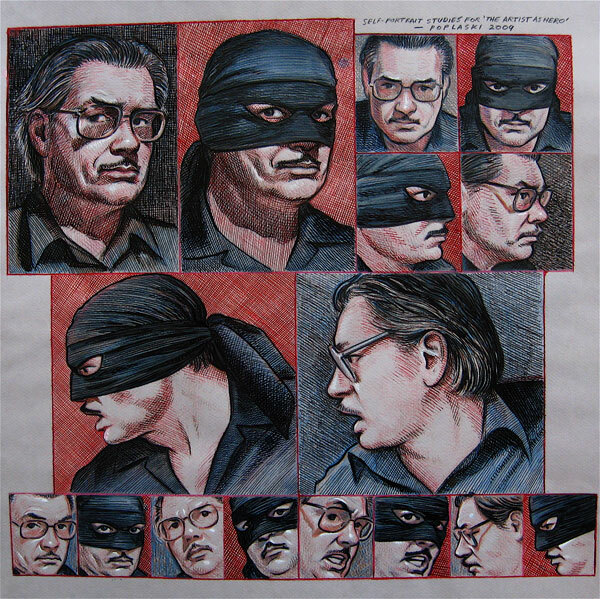 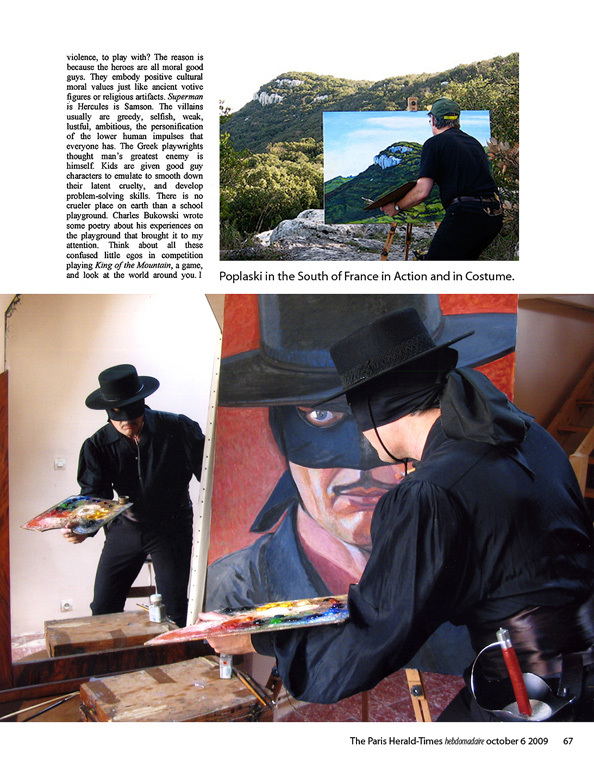 Many of the items and memorabilia are duplicates of Zorro specialist and artist, Peter Poplaski's personal collection. 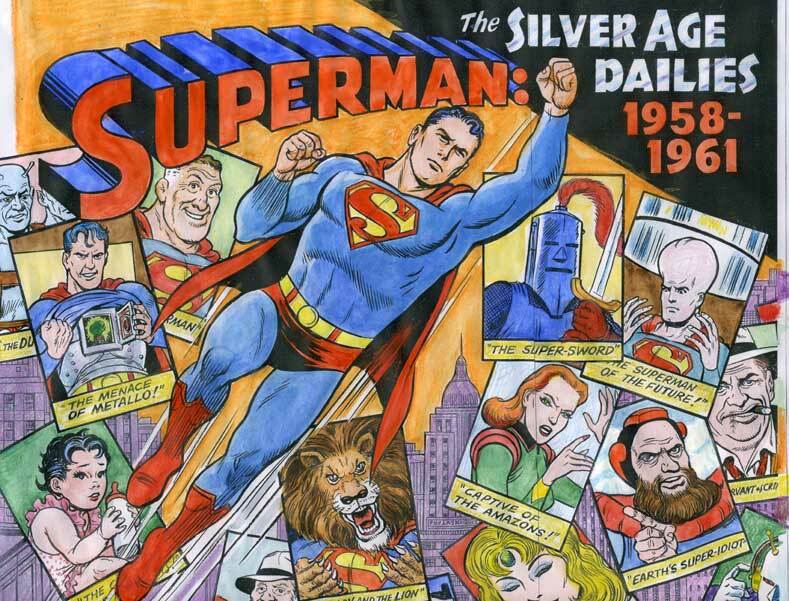 Poplaski says McCulley created the 'original’ super hero. 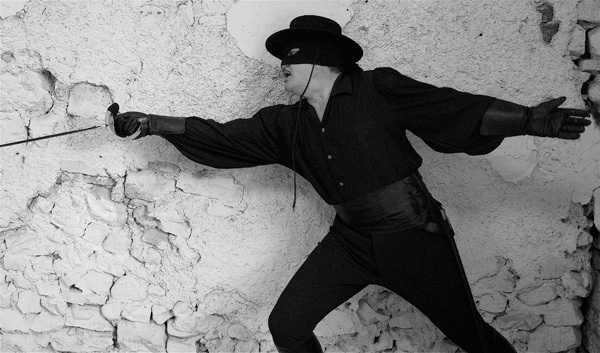 He said, "All the kids that went to Zorro in the 20's... 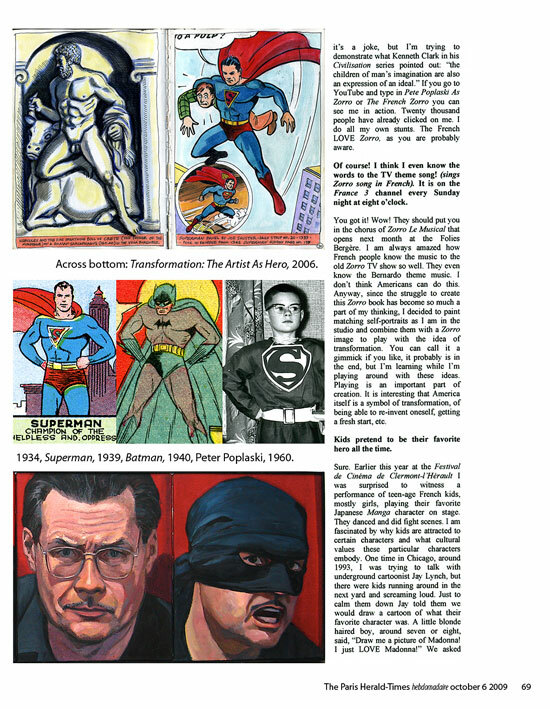 In the 30's they were creating their comic book characters. 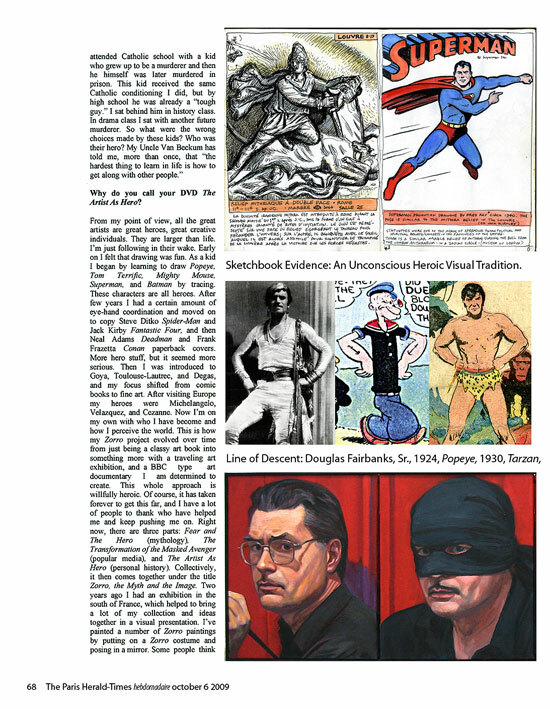 So they invented Superman based on Zorro and Douglas Fairbanks. 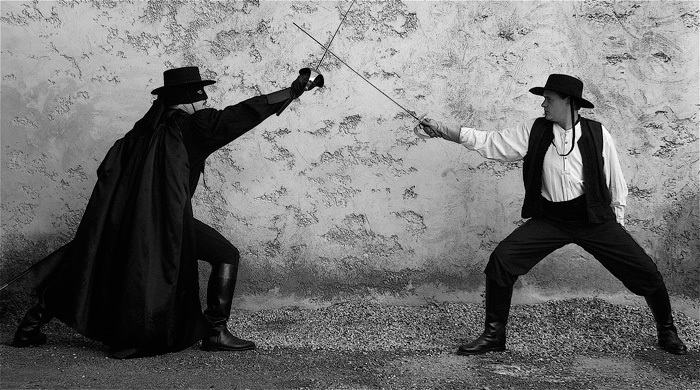 Batman was an upgrade of Zorro from California in the old days to modern day New York to now Gotham City and it continues to this day." 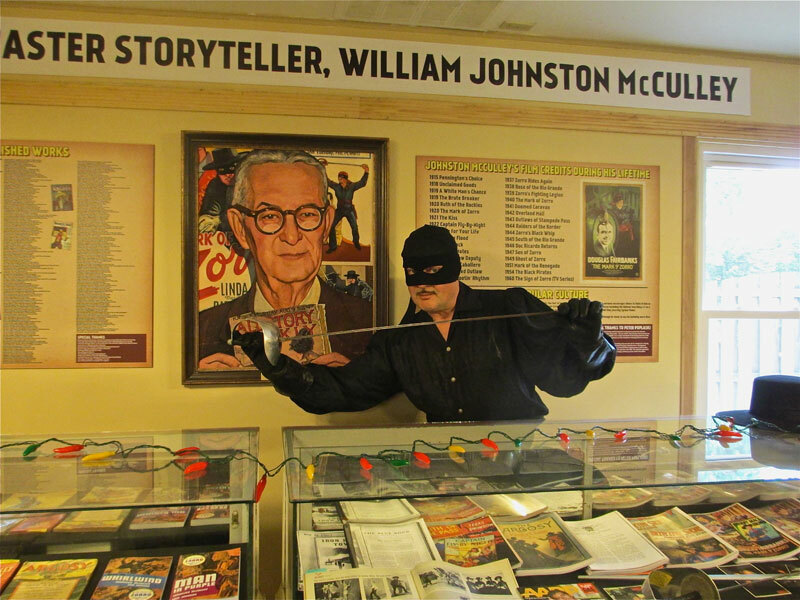 Poplaski says he was happy to share his memorabilia with the historical society because the Zorro exhibit is a great hook for Chillicothe. 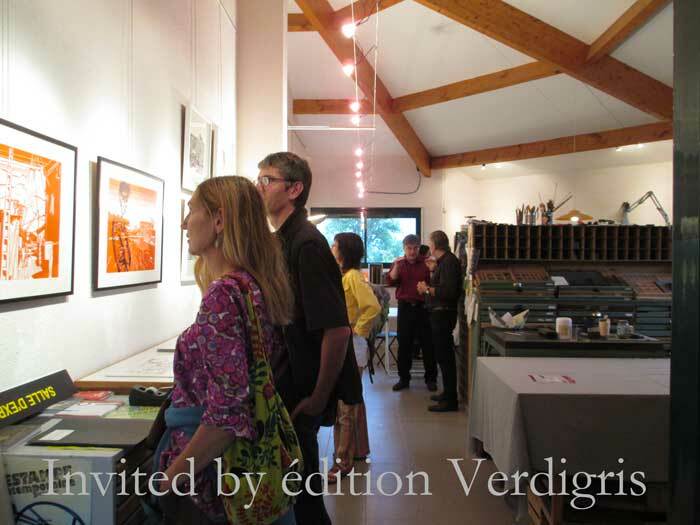 Reception: Sat. 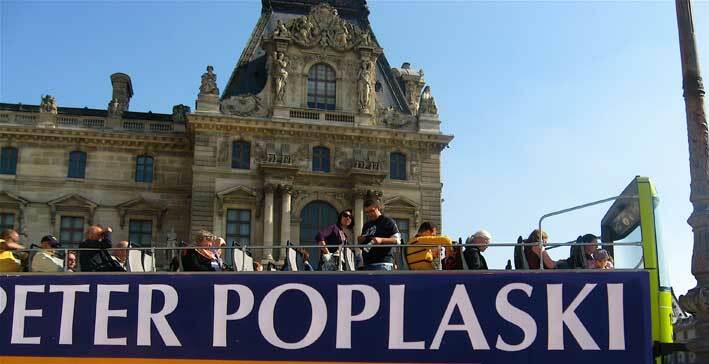 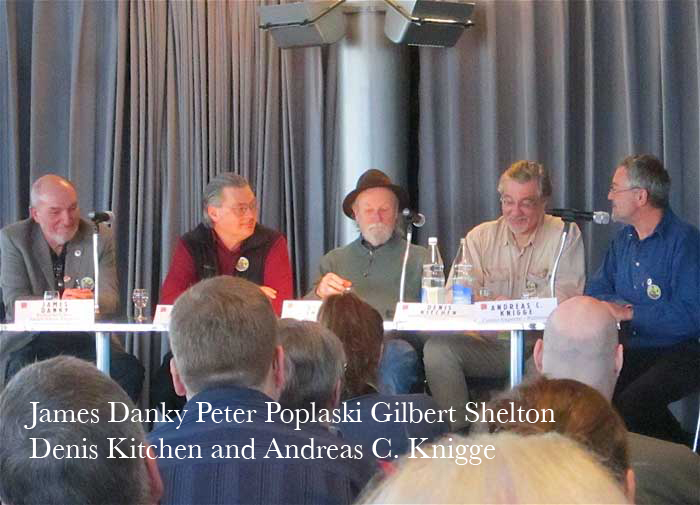 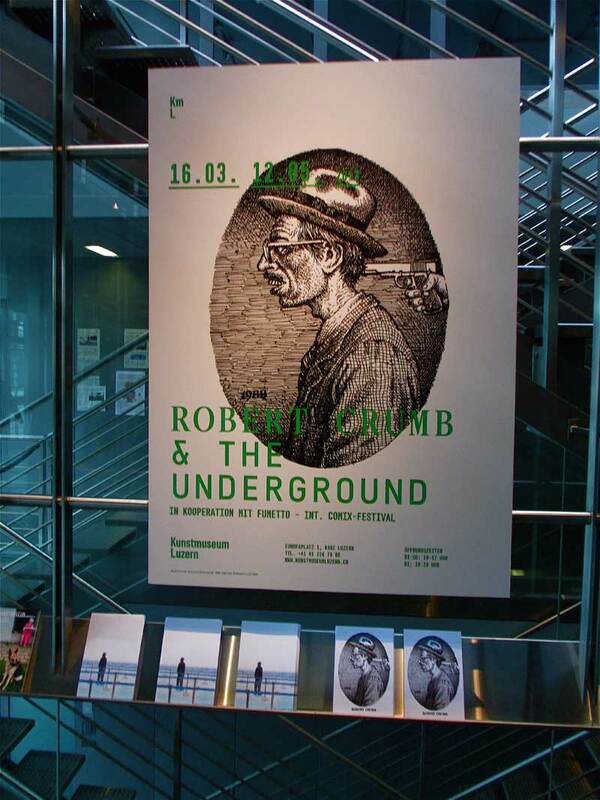 16March, 11.30 a.m.
Panel Discussion: Sat 16 March, 12p.m. 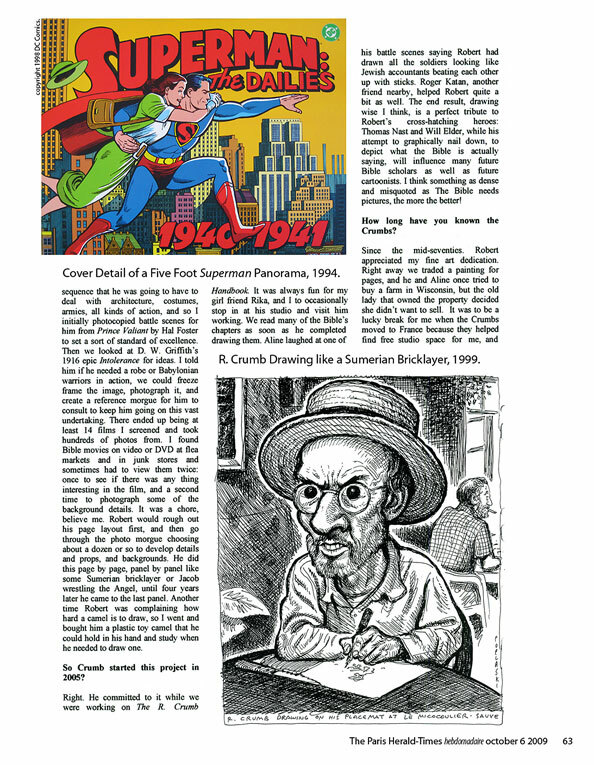 Working with Dean Mullaney at the Library of American Comics on 1960 s Superman. 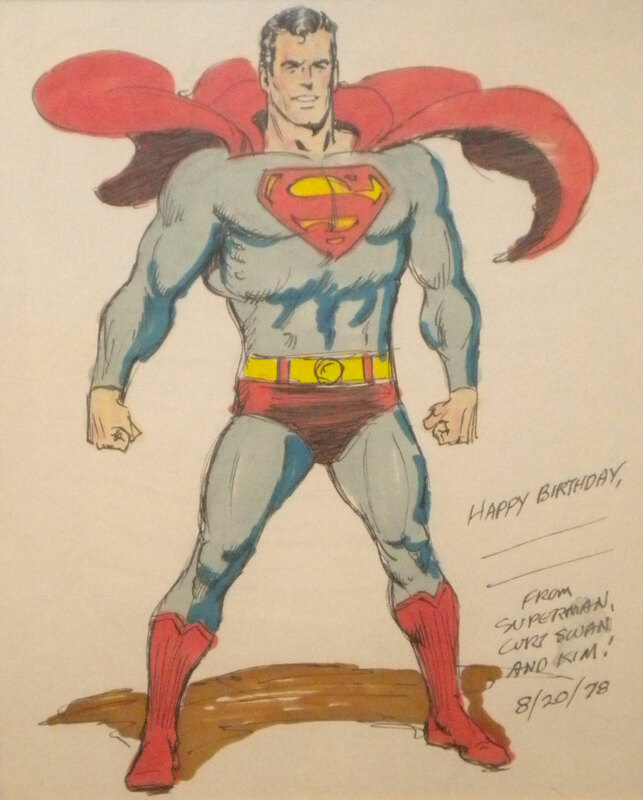 Once à Superman fan always a Superman fan! 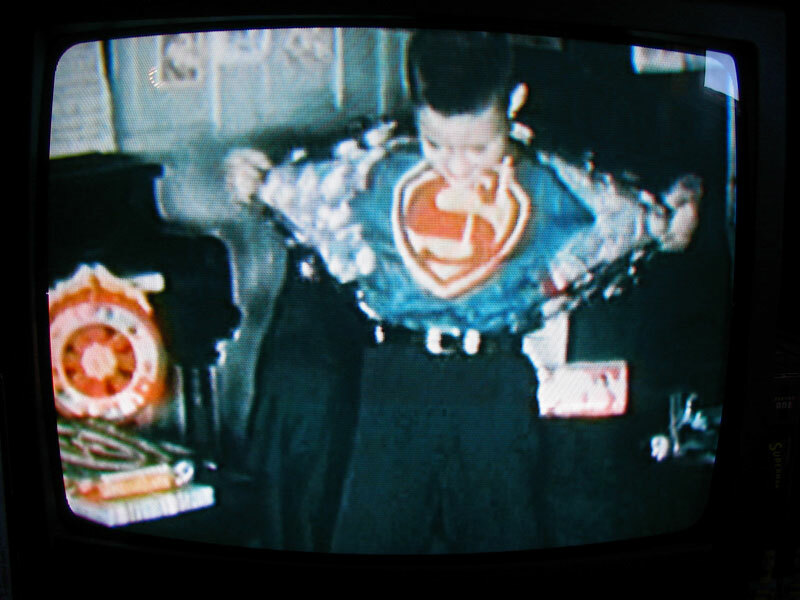 Super Pete age 9. 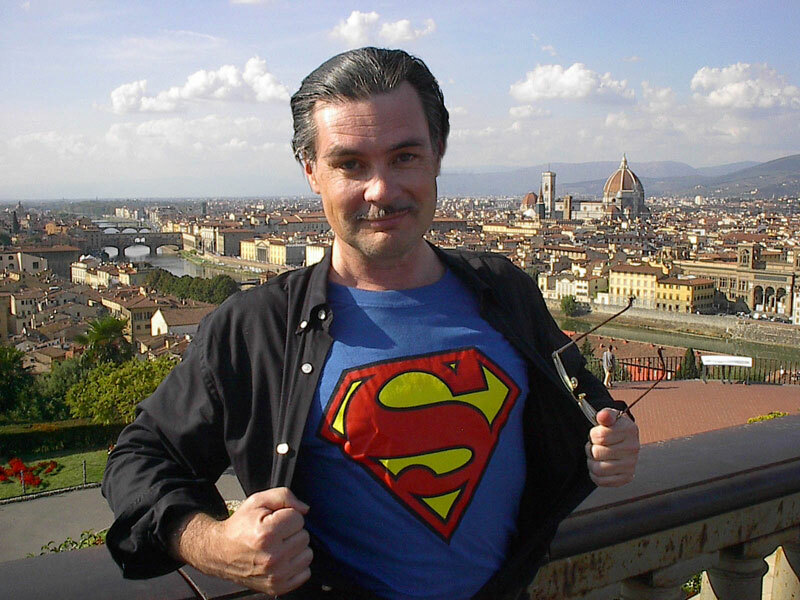 Super Pete in Italy 2003. 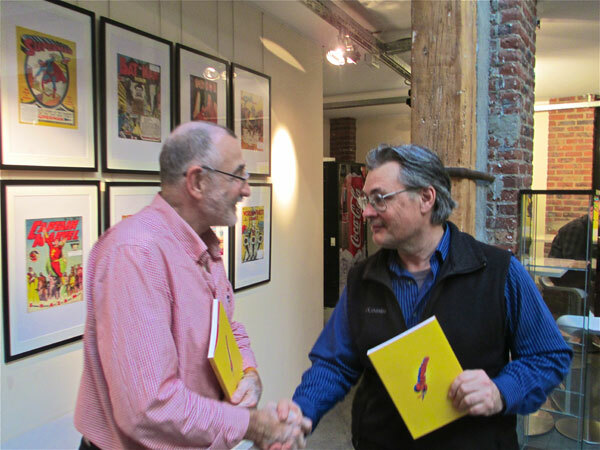 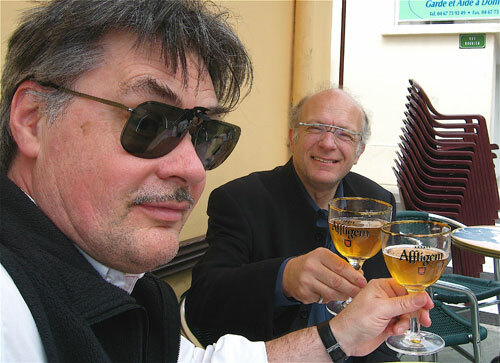 Peter at The Seed factory in Brussels with Mr Michiels one of the organizers. 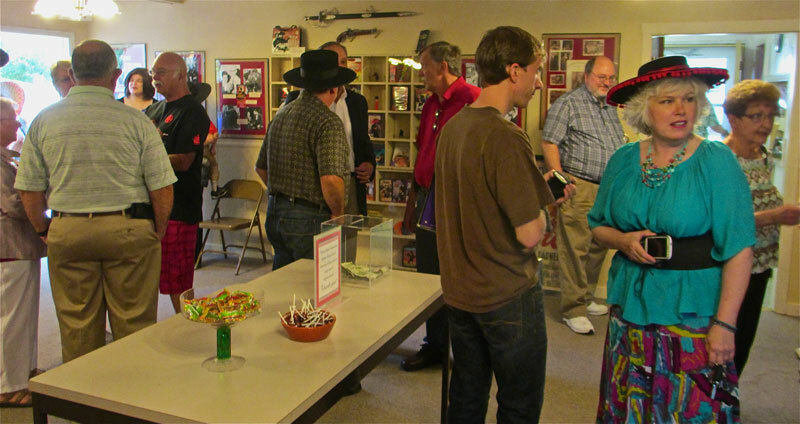 Movie Previews for Family and Friends to reflect on their place in time and space! 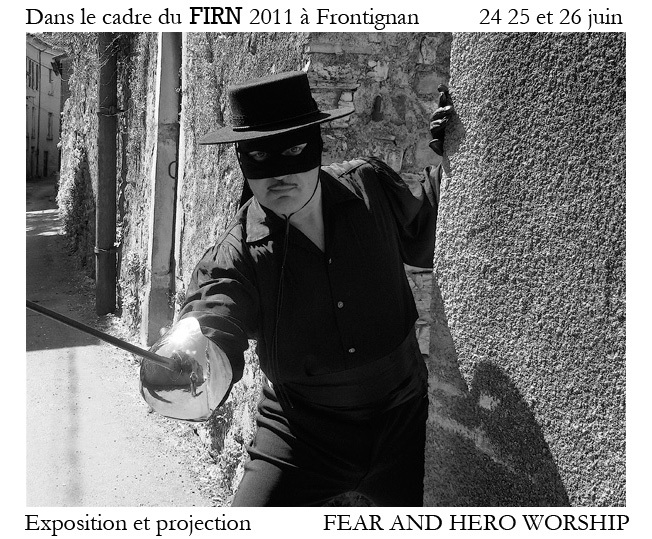 Saint Hippolyte du Fort, France. 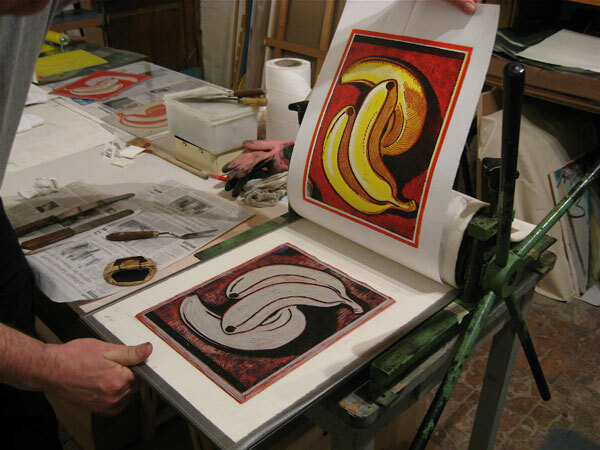 for lithography, Orr Street Columbia Missouri. 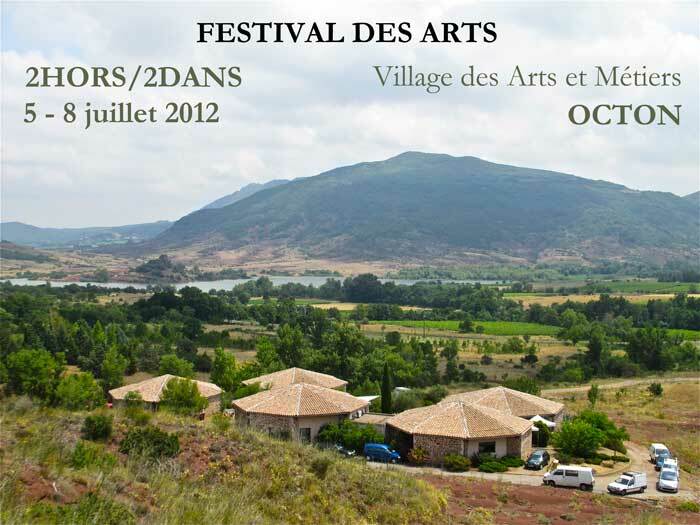 Village des arts et métiers Octon, France. 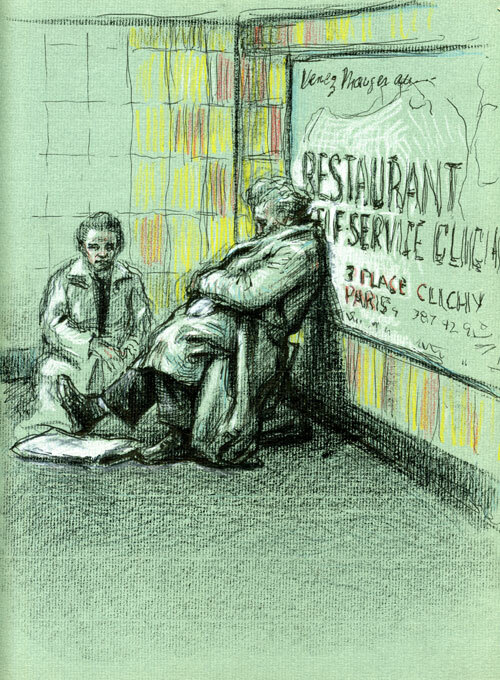 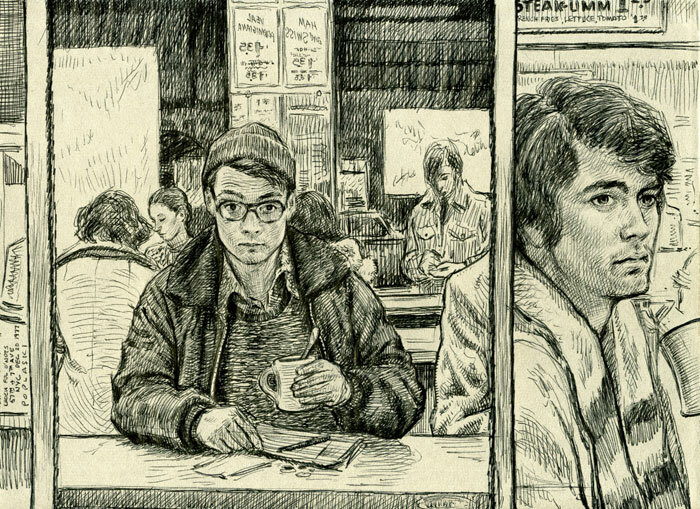 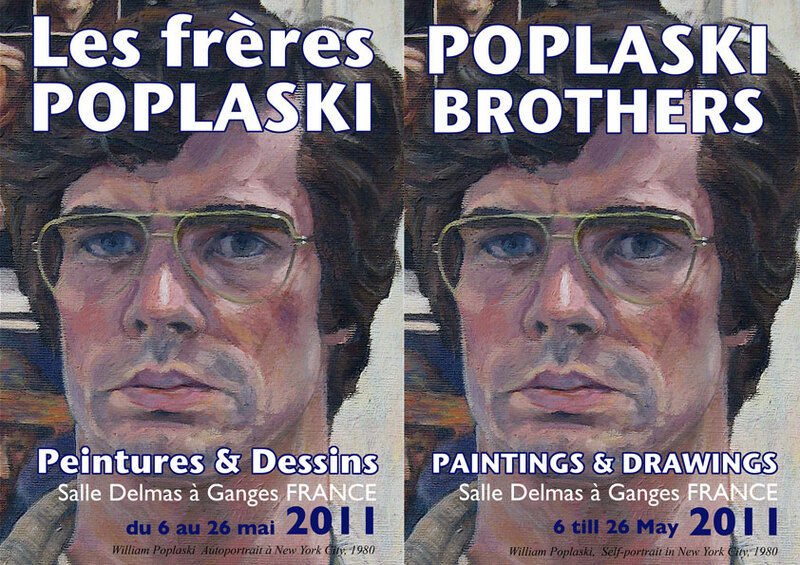 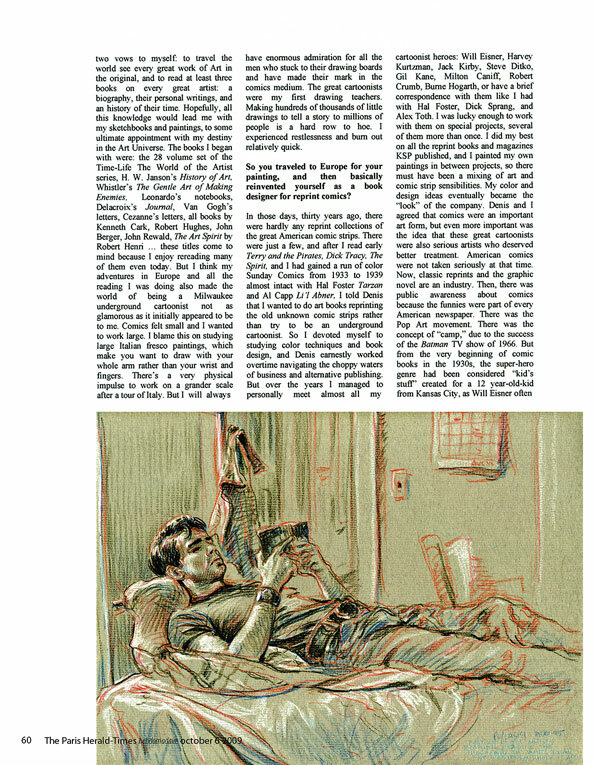 The brothers POPLASKI Peter et William Poplaski, les années ’70, dessins. 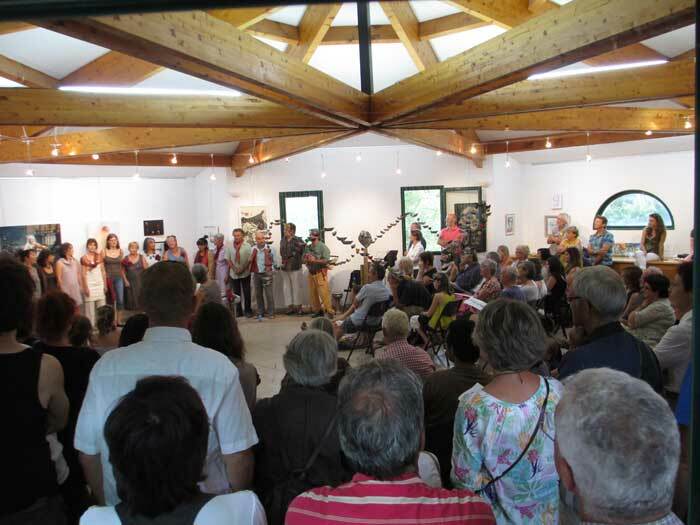 Salle Delmas, Médiathèque de Ganges, L’Hérault en France. 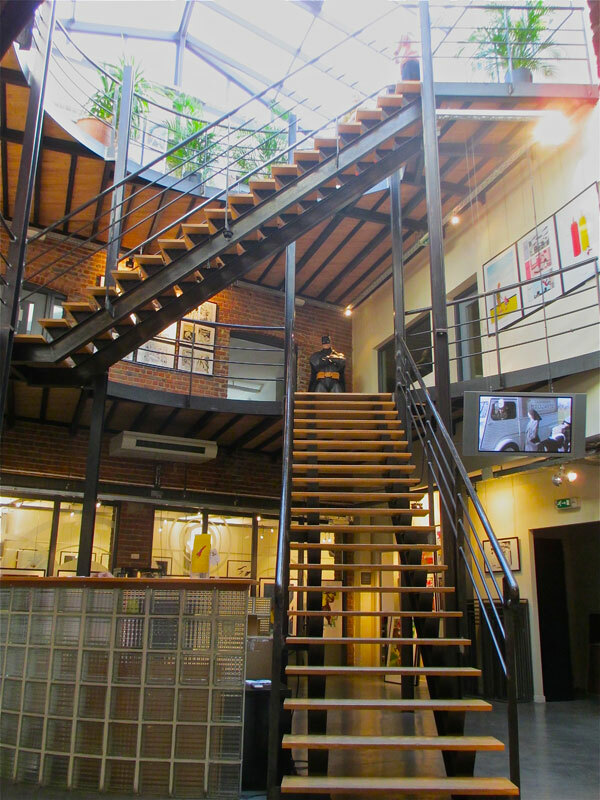 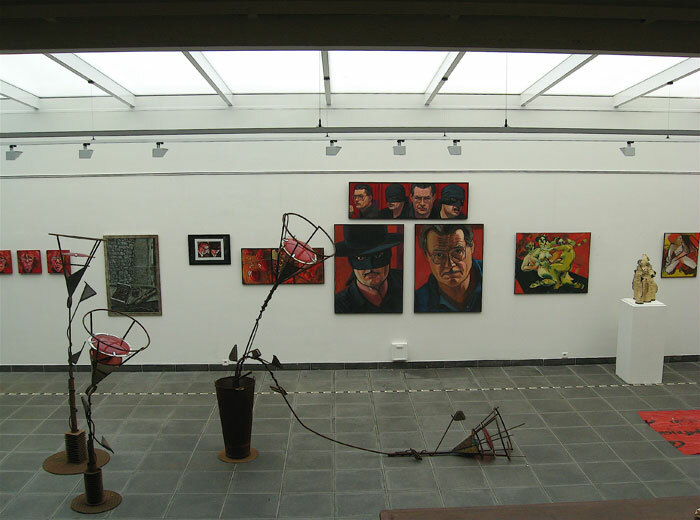 SAO PAULO center of the Arts BRAZIL. 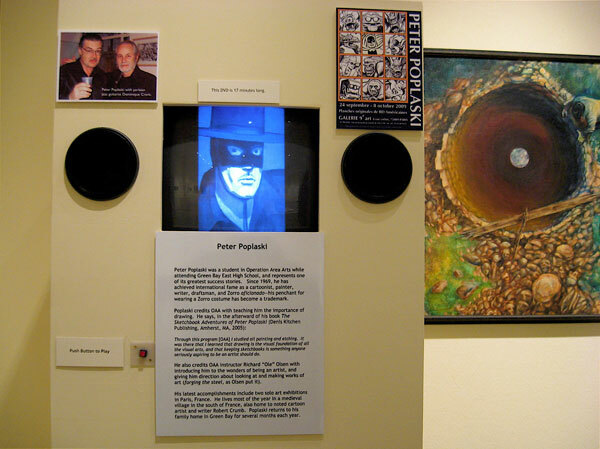 Will Eisner SPIRIT sculpture by Peter Poplaski represented by Denis kitchen. 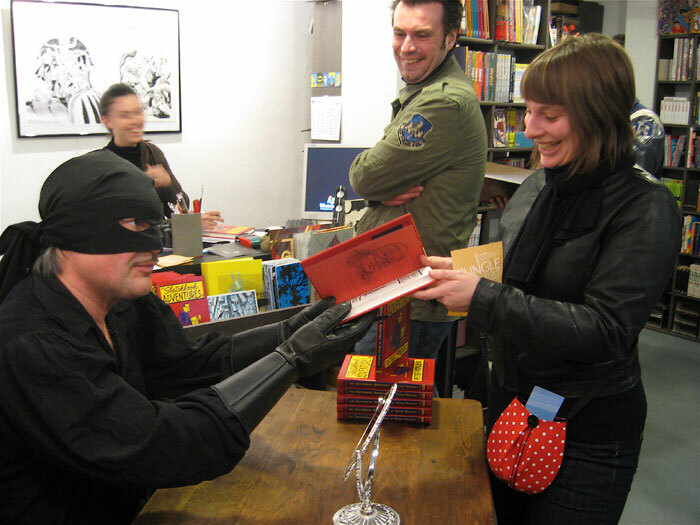 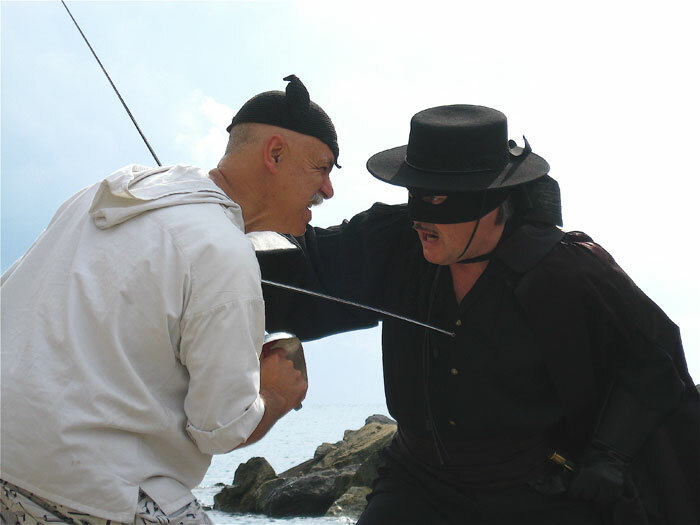 ZORRO fighting U Giancu for the Rapallo's comicsfestival 2011 ????! 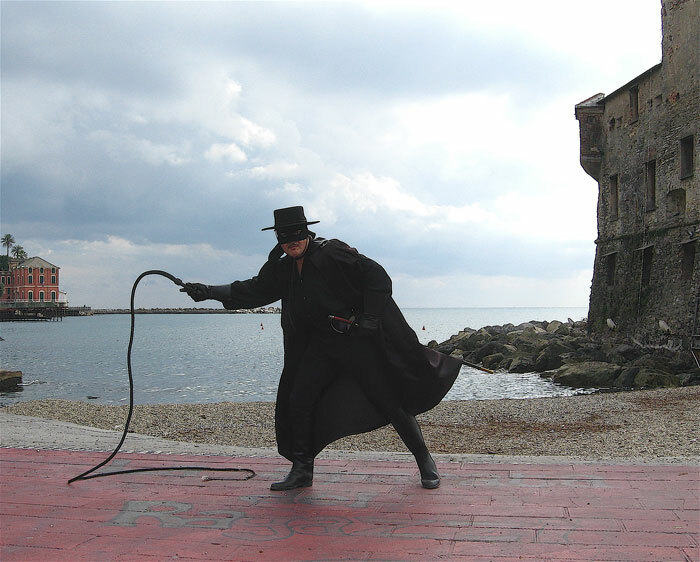 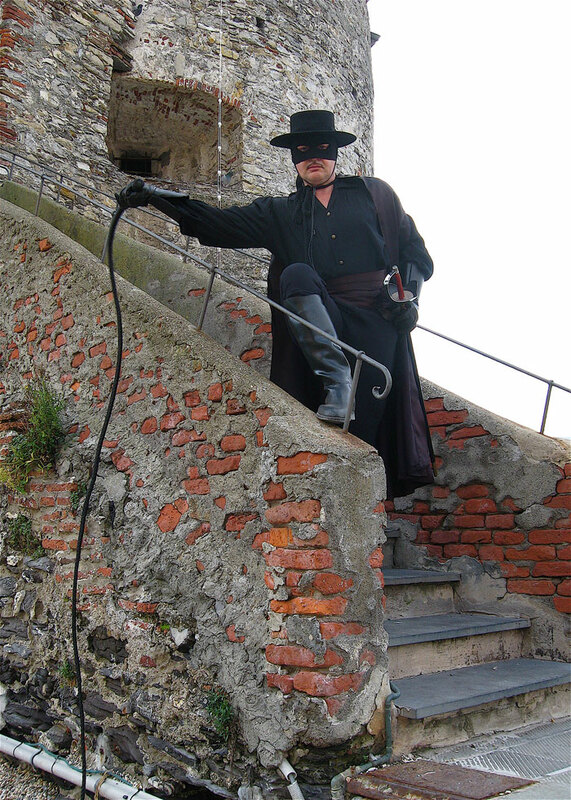 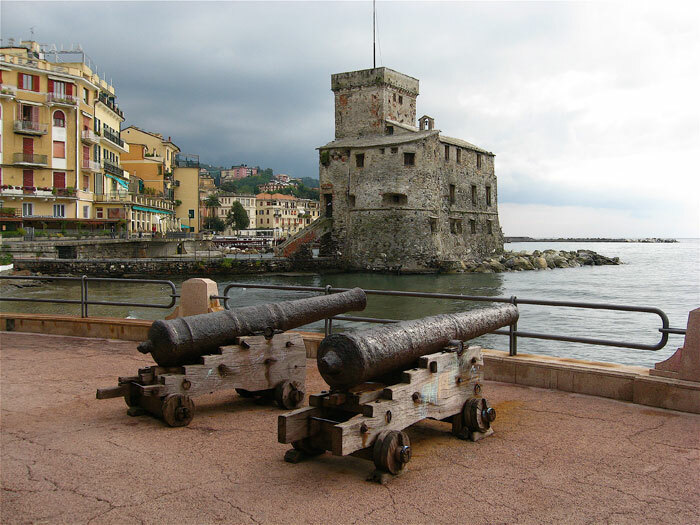 ZORRO IN RAPALLO, ITALY, OCTOBER, 2010. 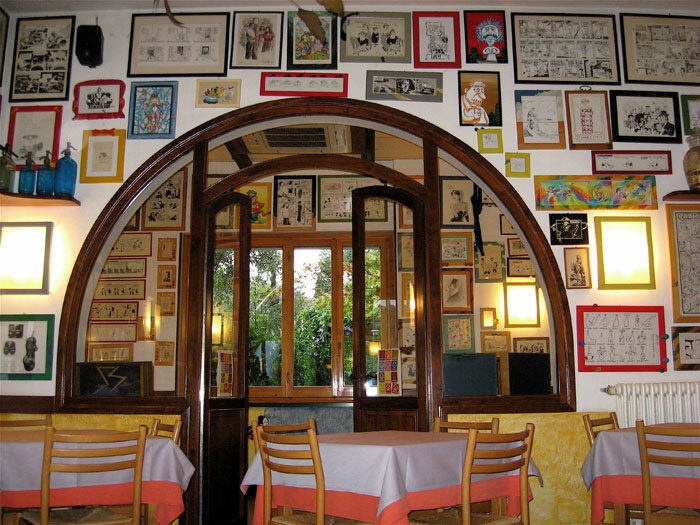 Rika and I have just returned from Rapallo, Italy where we were given the red carpet treatment by Fausto Oneto and his charming wife, Adriana, at their San Massimo ristorante U Giancu (ou-Jian-koo). 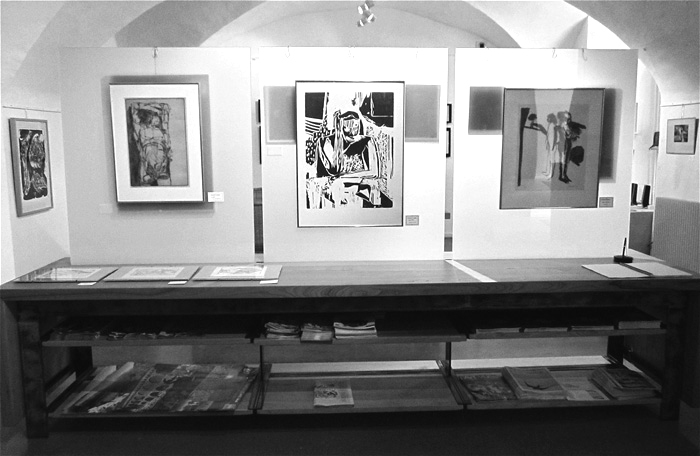 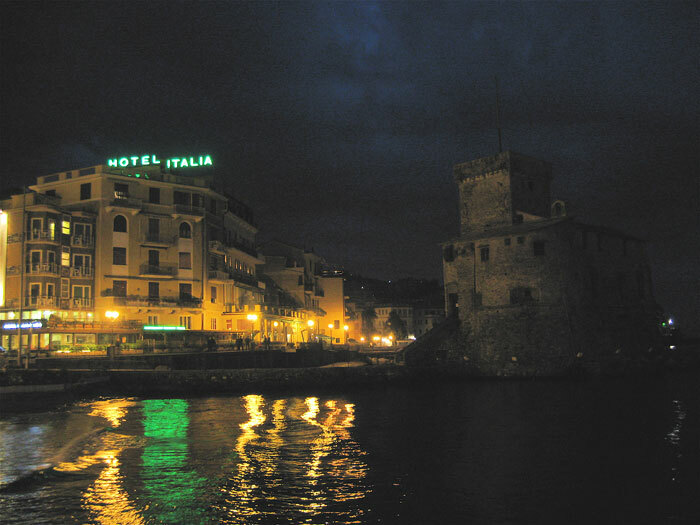 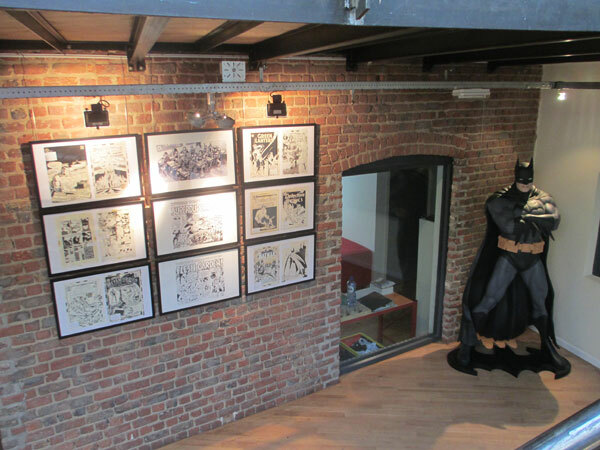 The following photos show the ristorante U Giancu, a small part of Fausto Oneto’s world-class original comic art collection, the Rapallo Antico Castello Sul Mare located in old harbor, exterior and interior gallery spaces, Peter Poplaski as Zorro, Fausto Oneto dueling with Zorro (recreating the classic Errol Flynn-Basil Rathbone 1935 Captain Blood sword fight), Zorro crossing blades with Carlo Chendi, and the fortress at night. 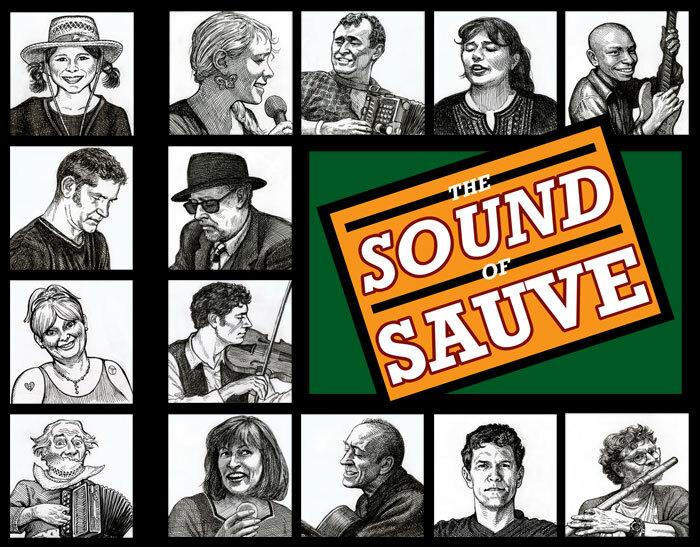 GREAT MUSIC COMING YOUR WAY JULY 8TH from SAUVE !!! 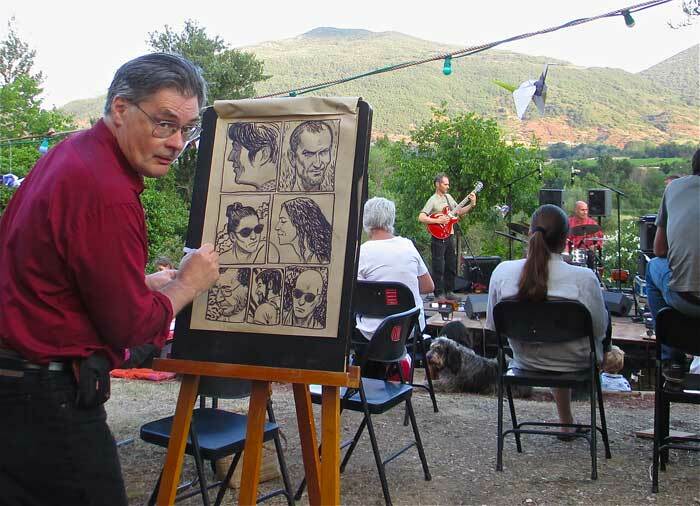 It’s an incredible combination of SOUND and ART that only can happen in the beautiful south of FRANCE when the planets are in alignment! 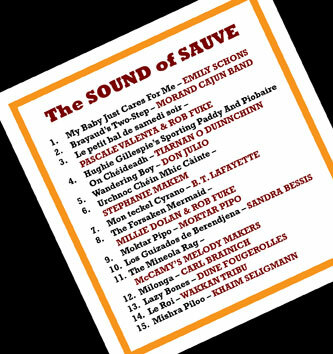 Only Rob Fuke could produce this CD from the cream of the crop of some of the best music played in Sauve, France! 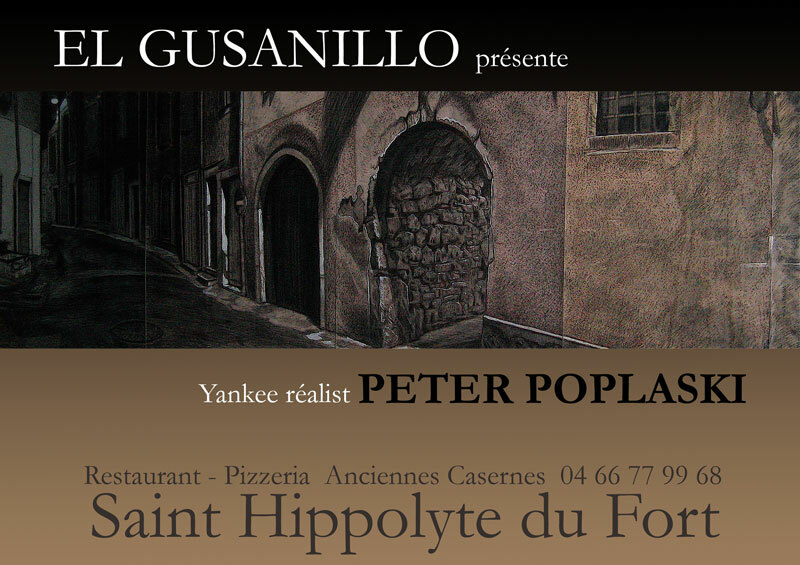 Eighteen Musicians are Especially Drawn by Peter Poplaski for the cover art and the Disc itself is the Famous “Aperitif à Sauve” painting now in a private collection in Hamburg, Germany! 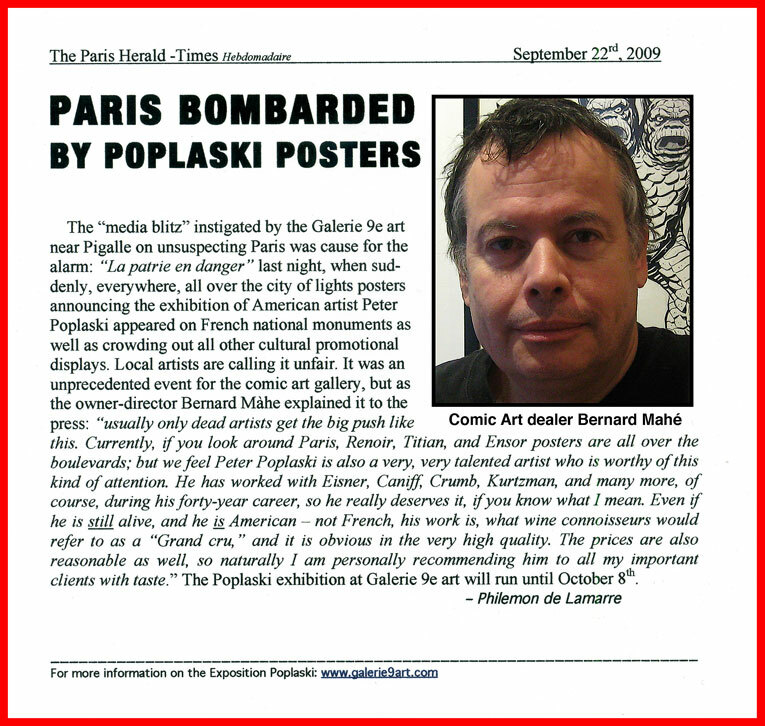 THIS FABULOUS DISC is being pressed AS YOU READ THIS in Scotland for its big release during the festival “MAD in SAUVE,” July 9th and 10th, 2010. 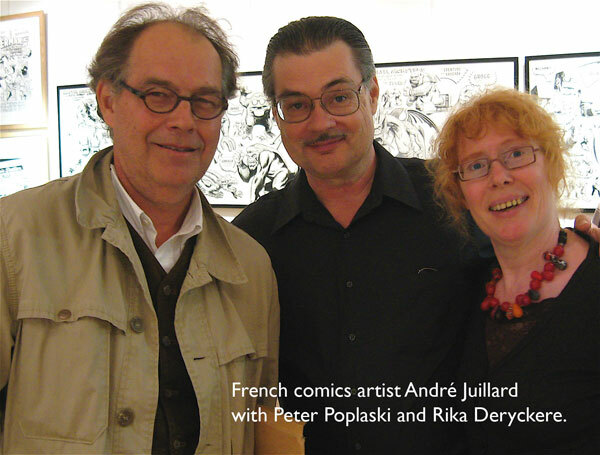 (MAD=MUSIC, ART, and DANCE)! 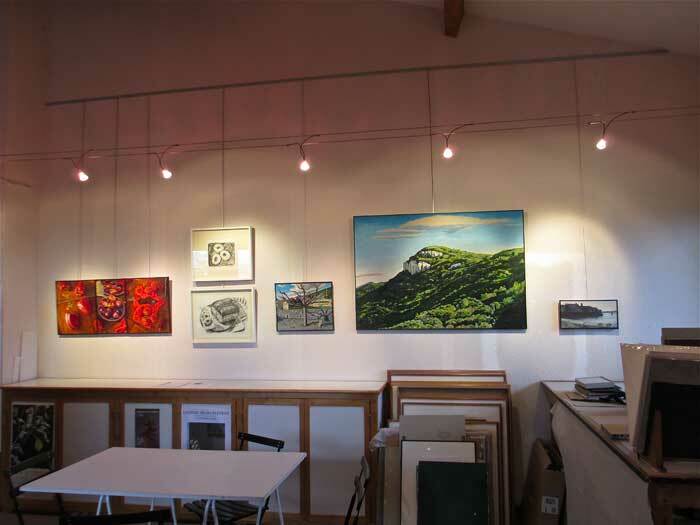 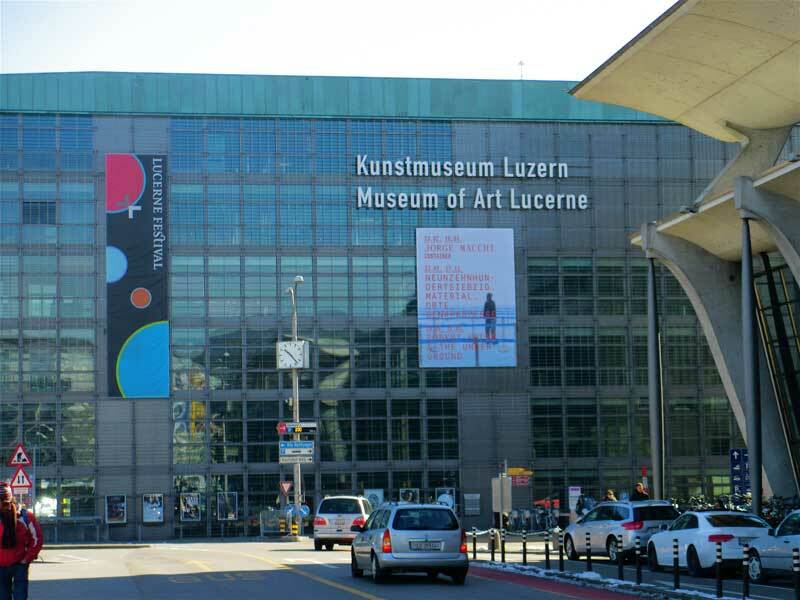 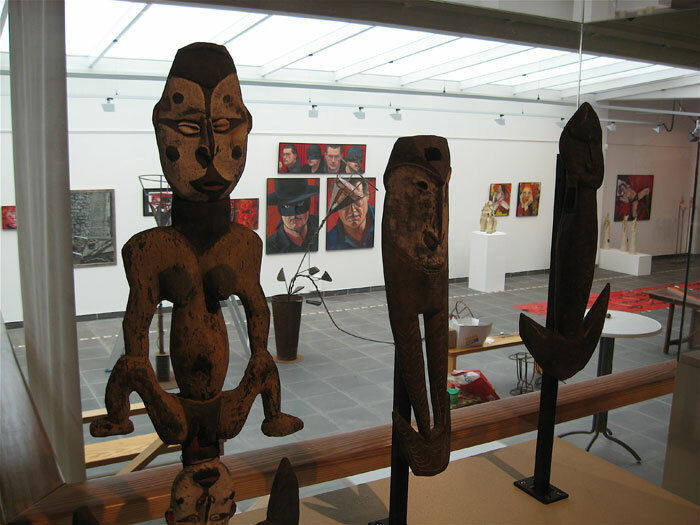 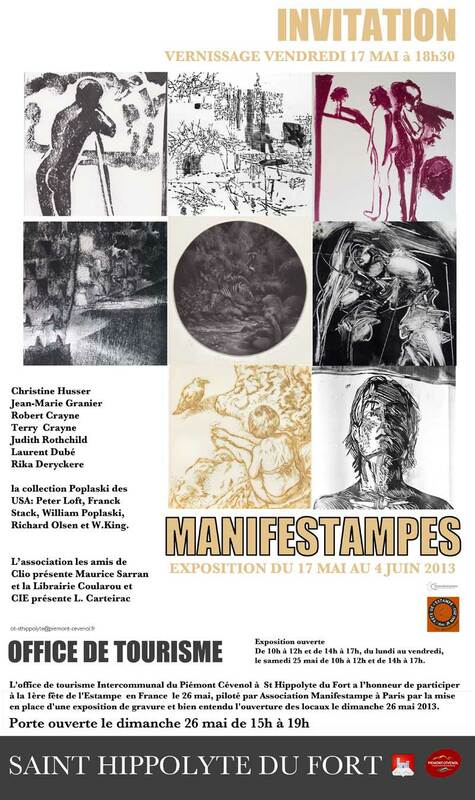 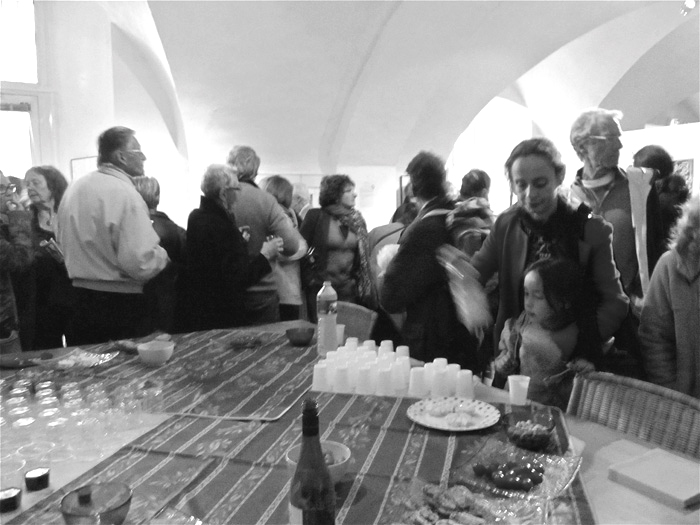 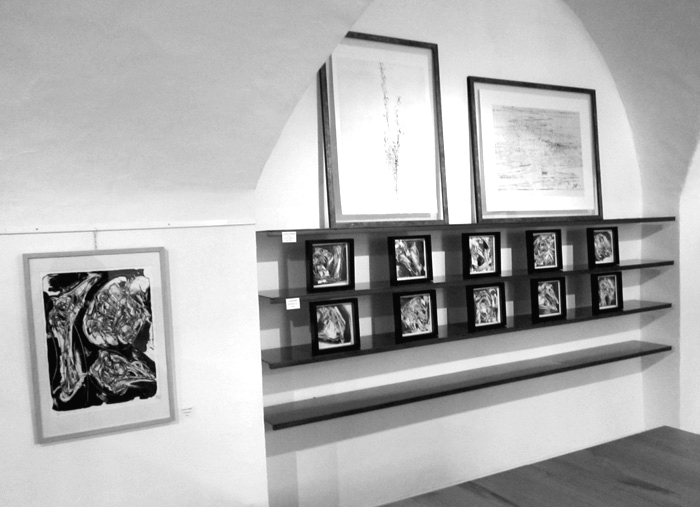 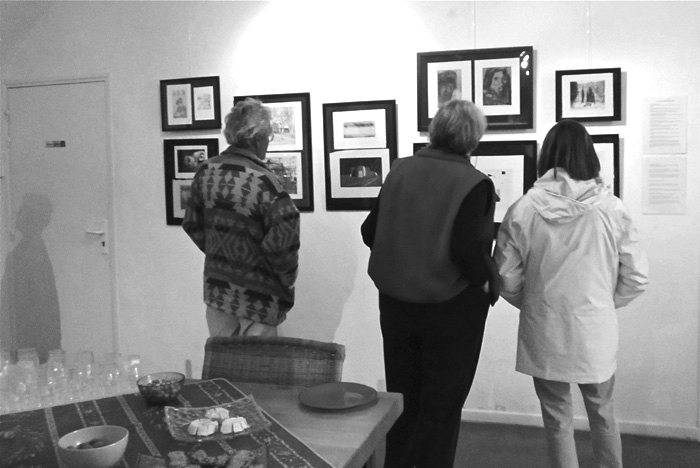 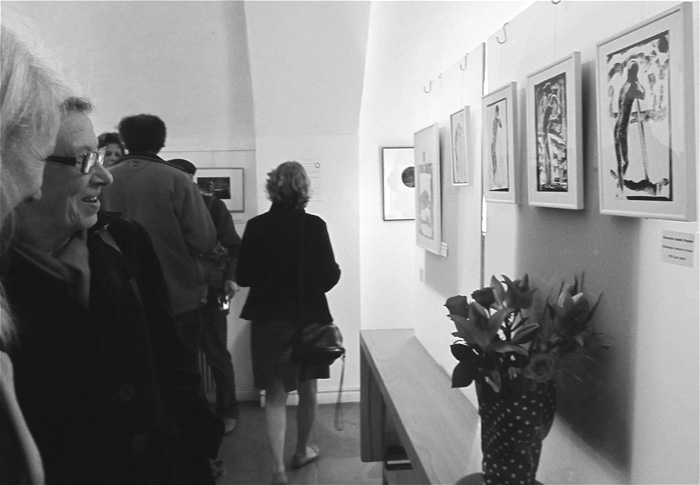 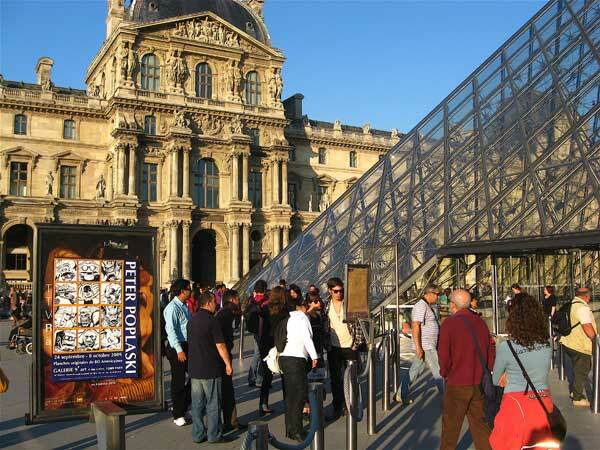 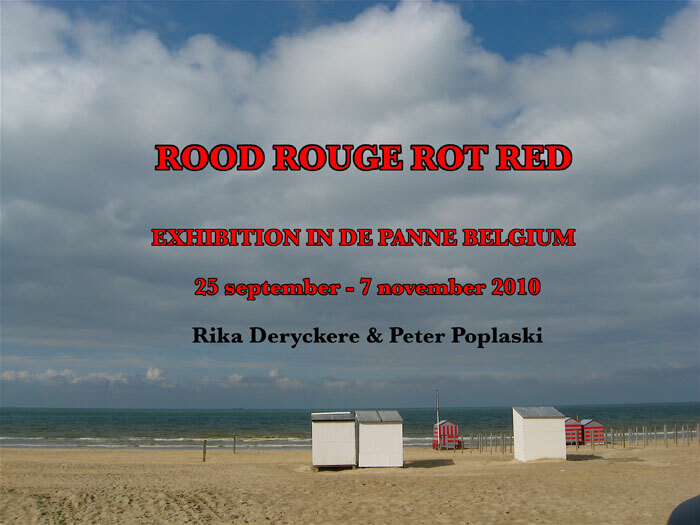 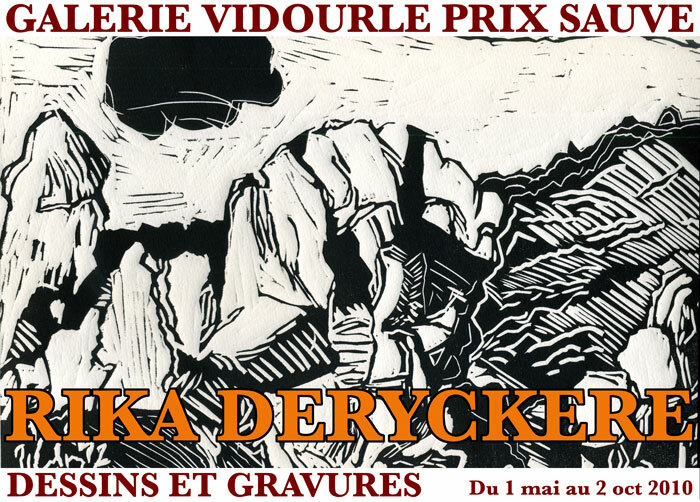 Exhibition of paintings, drawings and engravings. 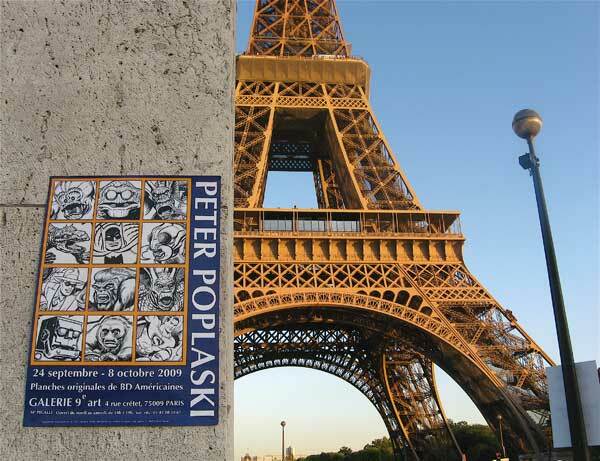 The SKETCHBOOK ADVENTURES of PETER POPLASKI. 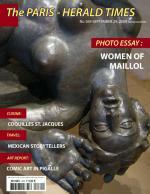 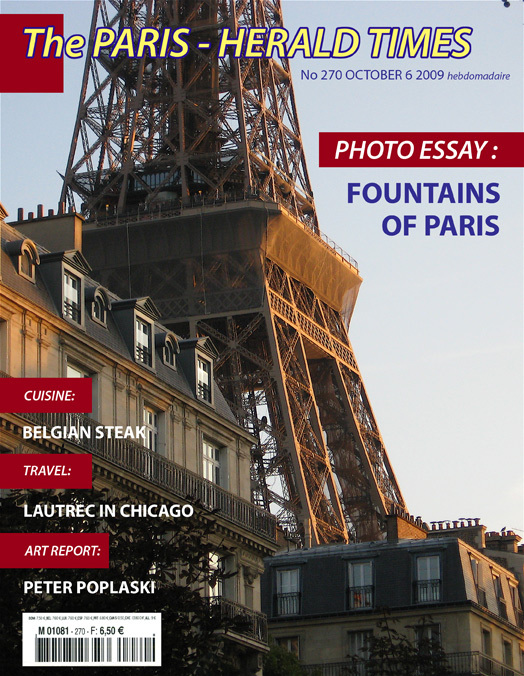 MQ Publications Ltd, London and New York. 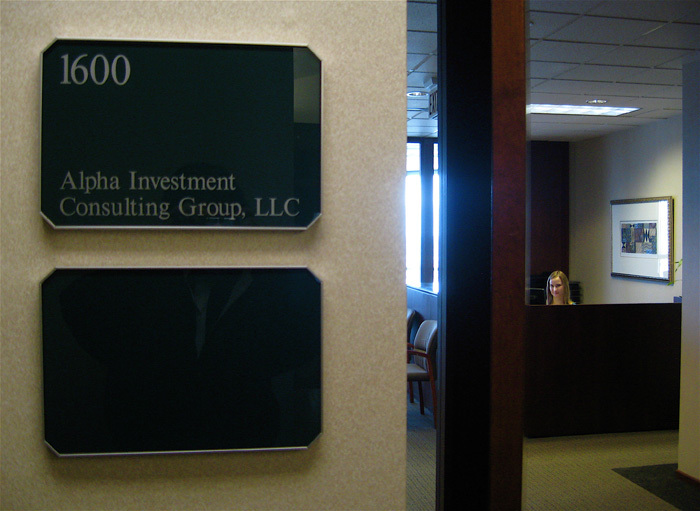 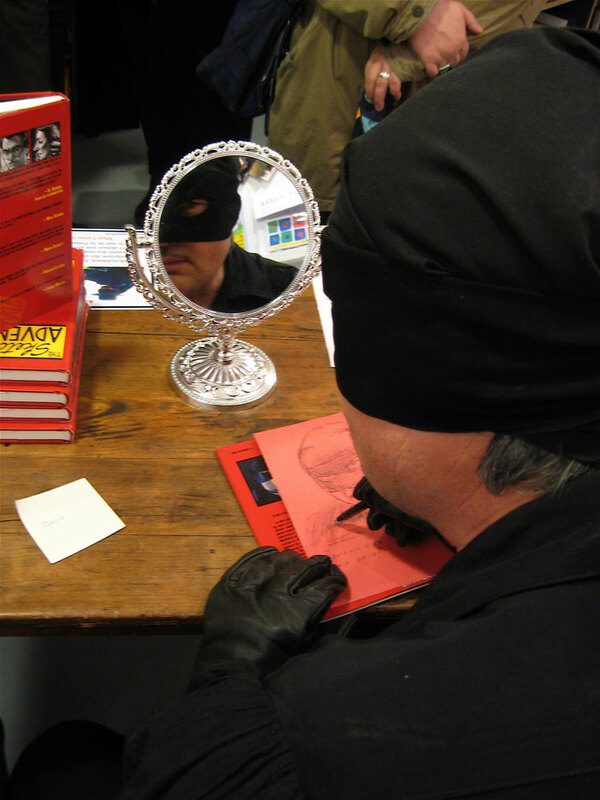 Book promotion tour : London, New York, Toronto, Chicago, Green Bay, Wisconsin, USA. 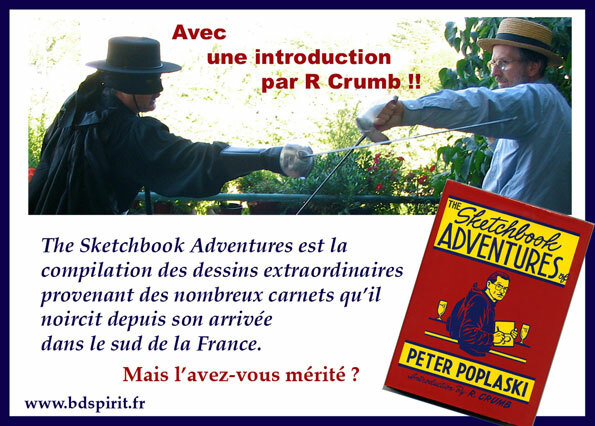 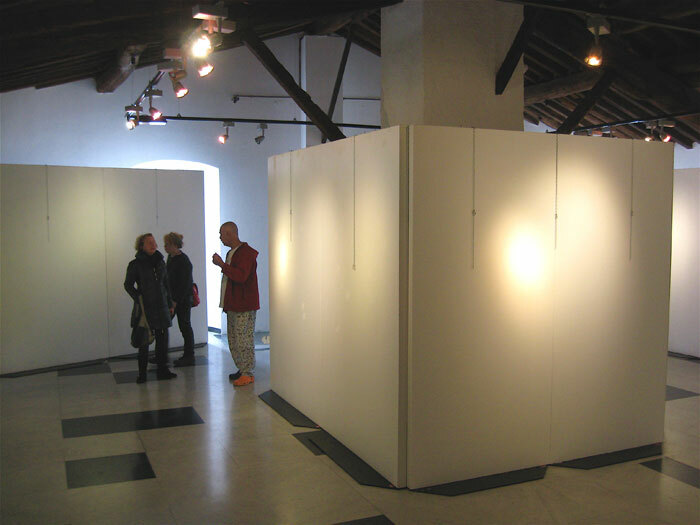 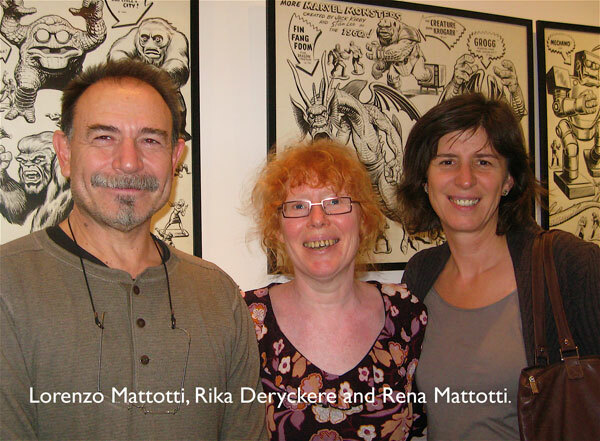 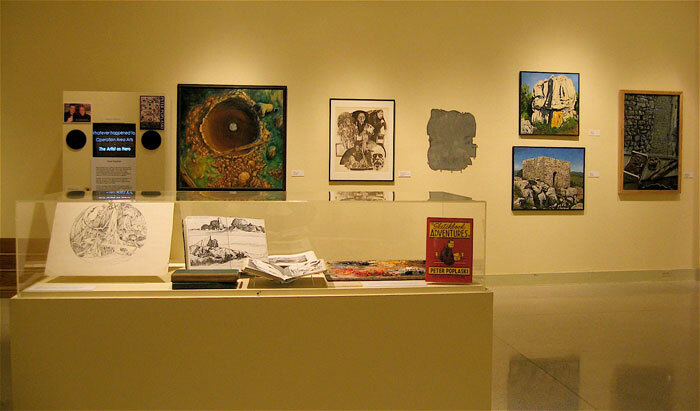 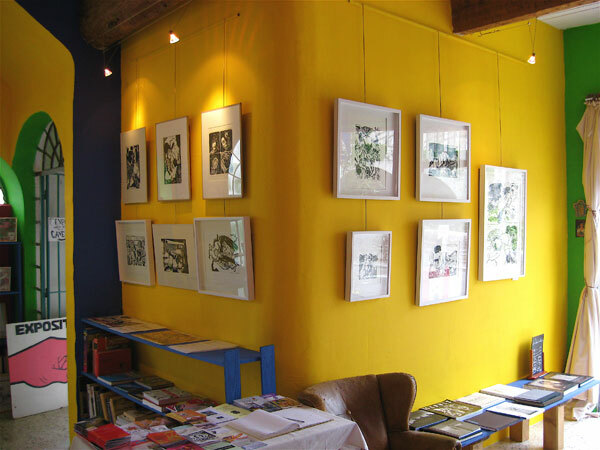 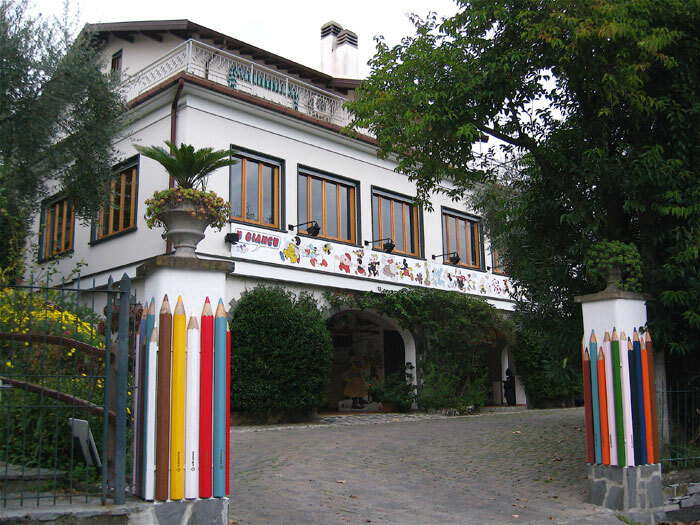 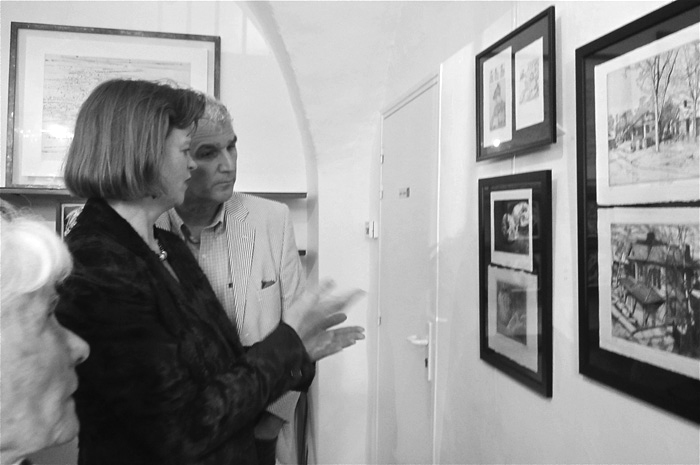 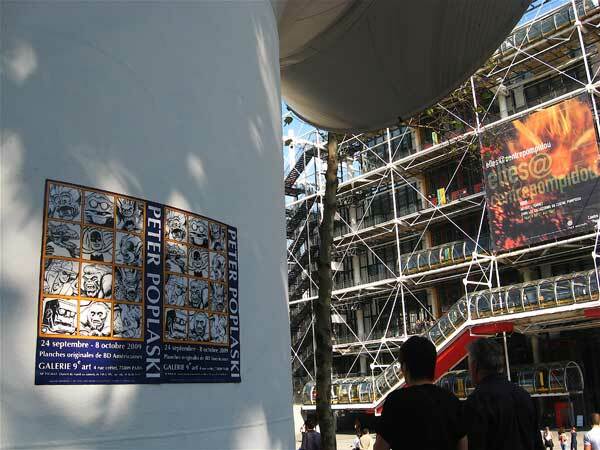 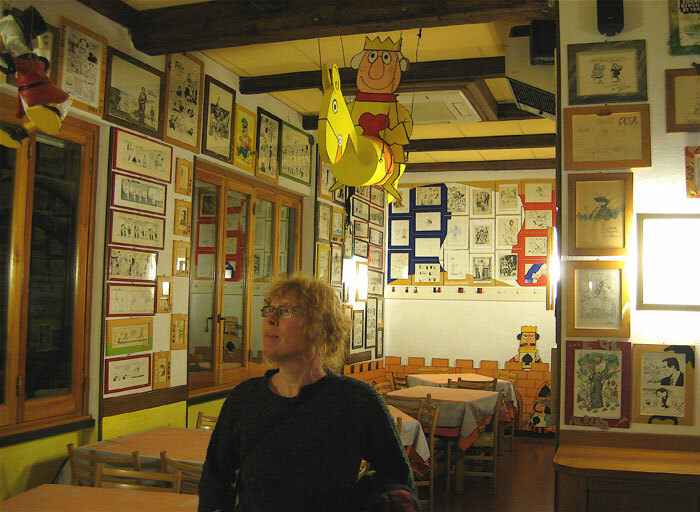 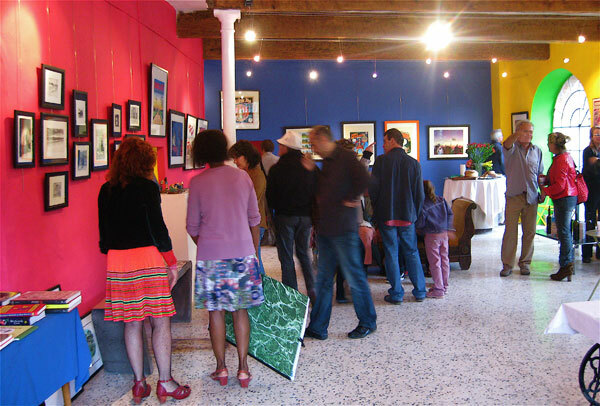 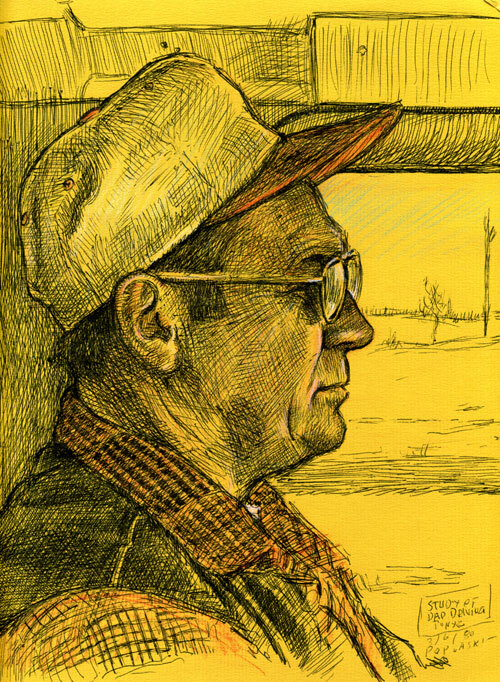 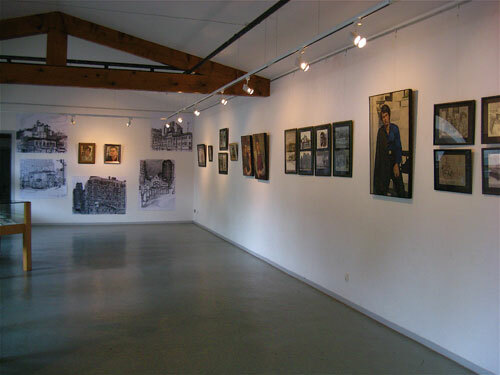 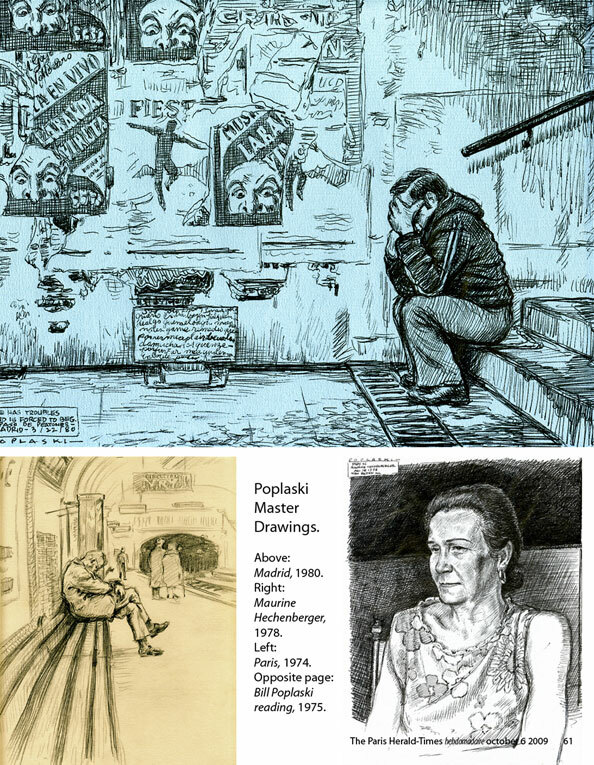 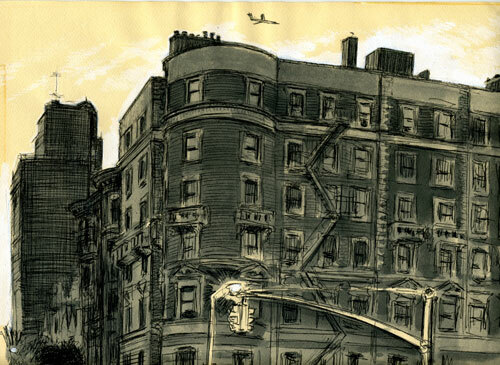 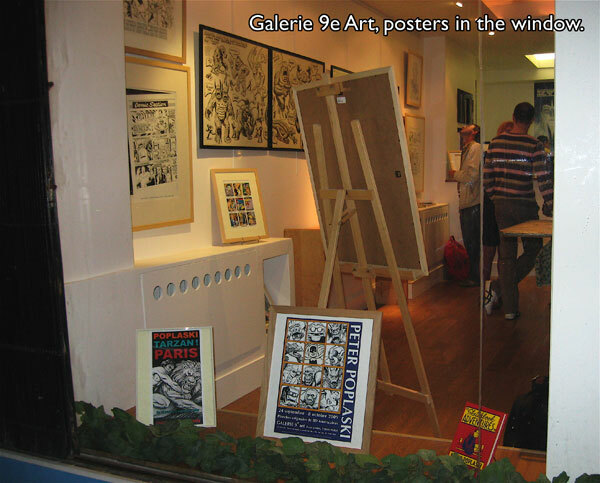 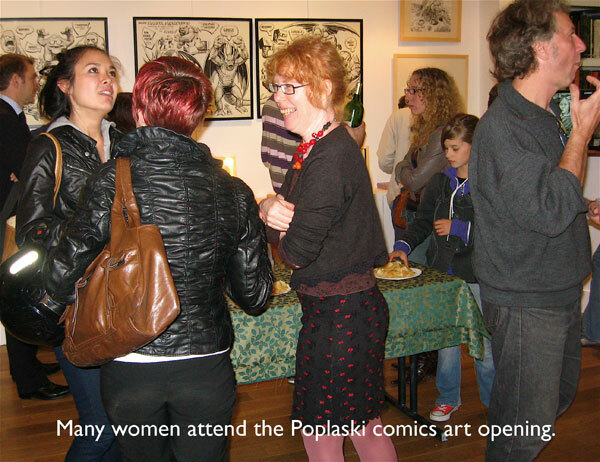 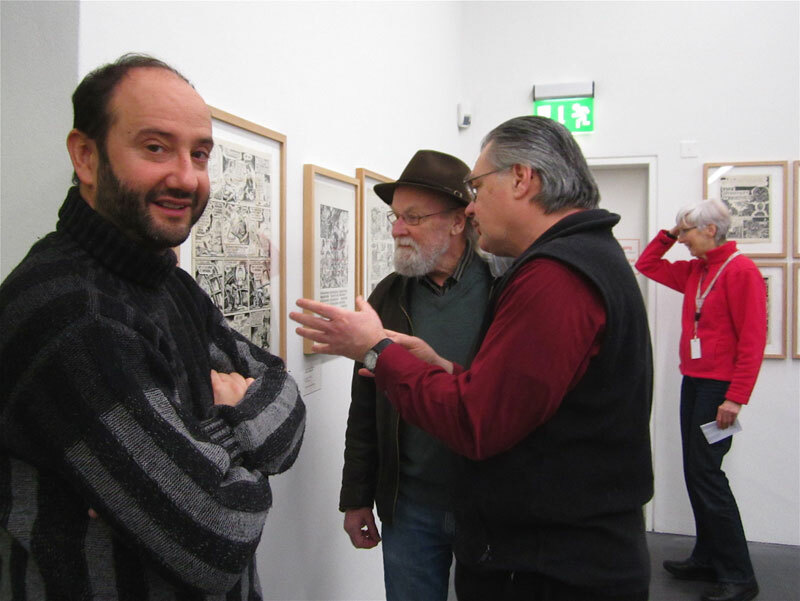 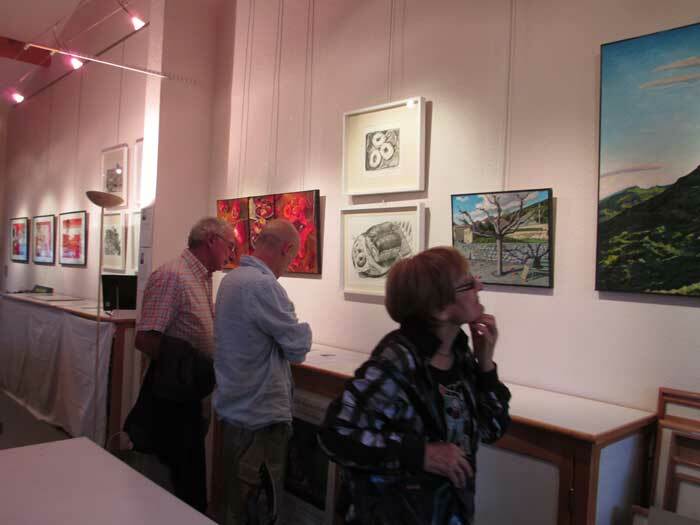 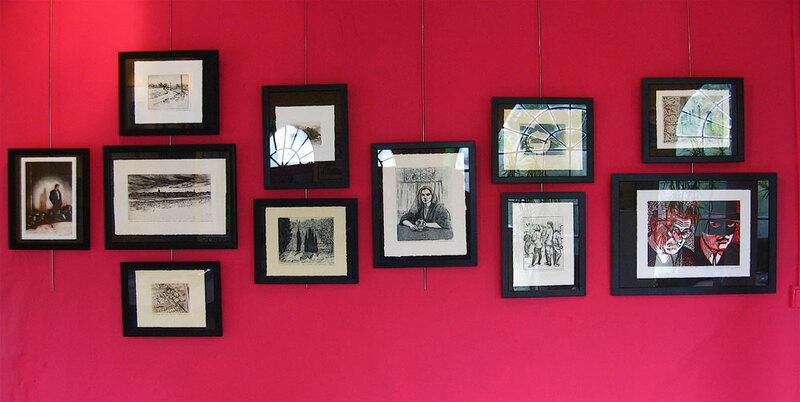 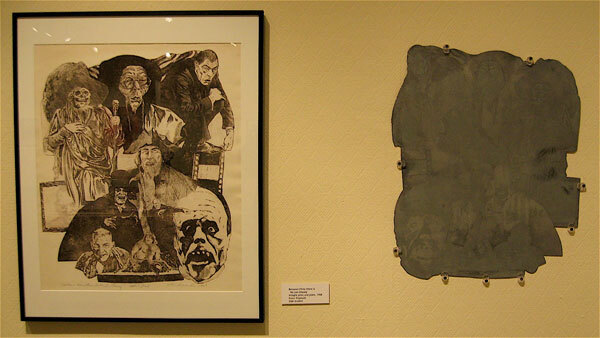 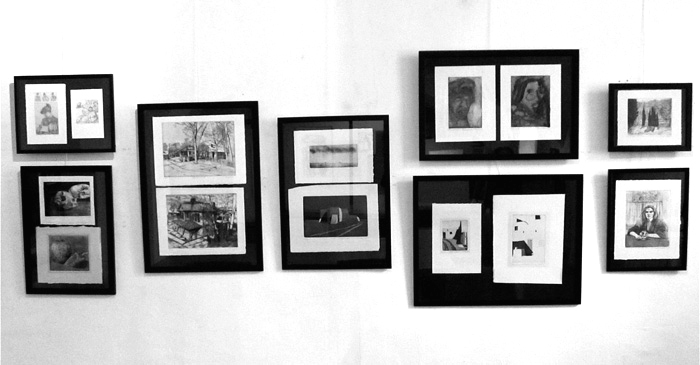 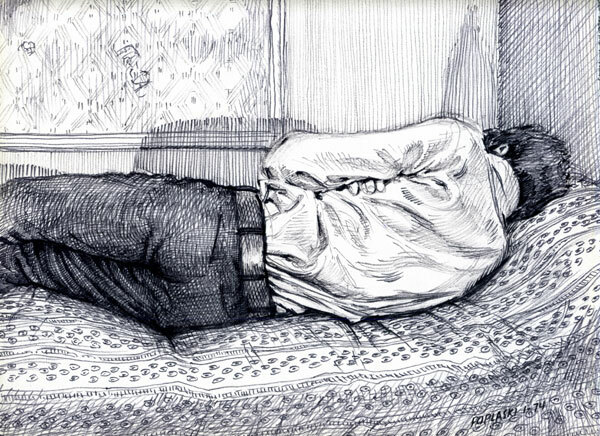 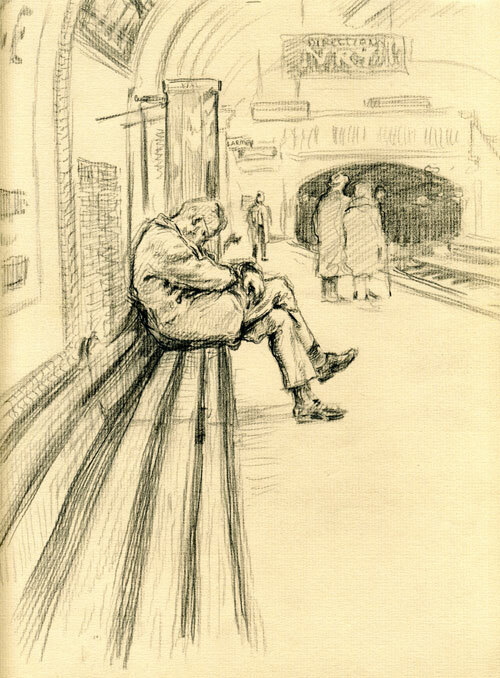 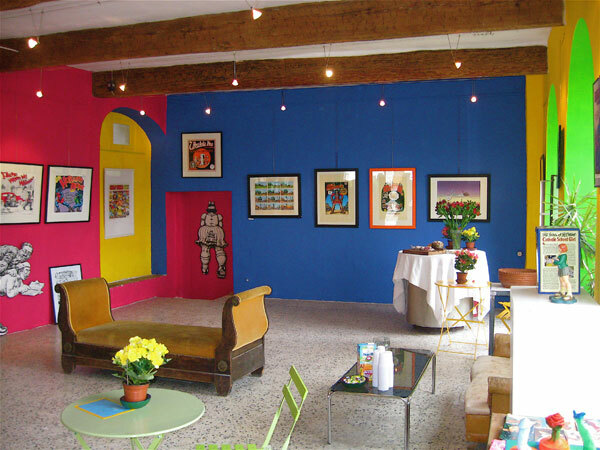 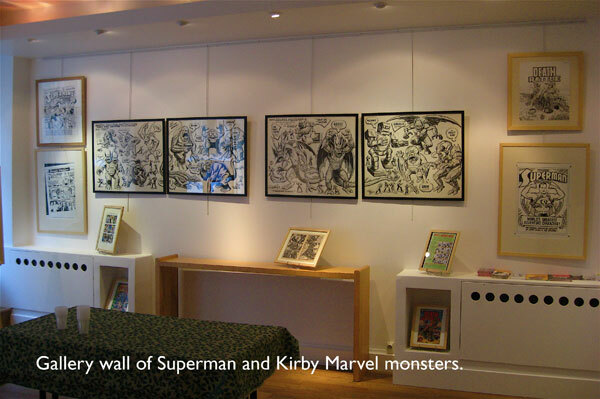 Exhibition of the original drawings of "The Sketchbook Adventures of Peter Poplaski". 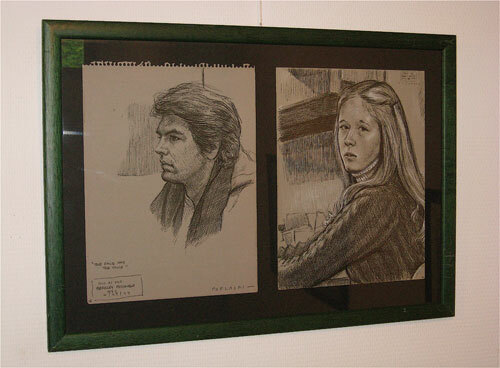 Peter Poplaski and Rika Deryckere. 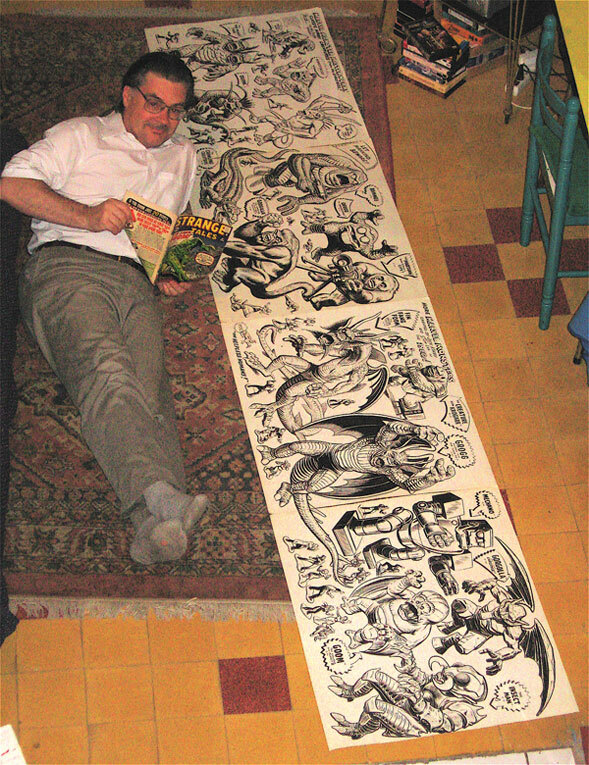 Book by Will Eisner with PeterPoplaski published by Norton, USA. 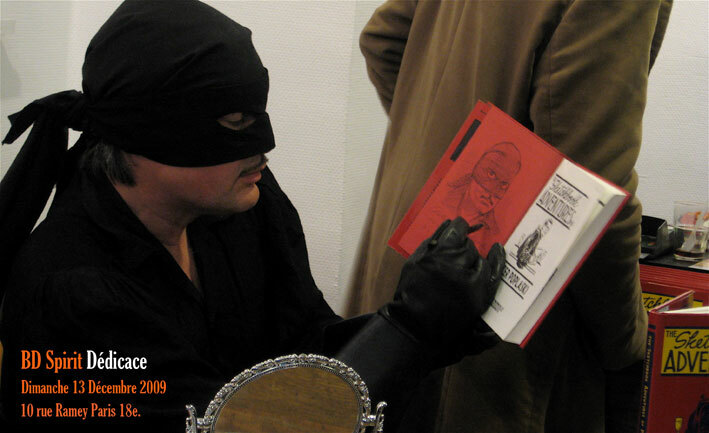 une étude sur l'image archétype du héro masqué. 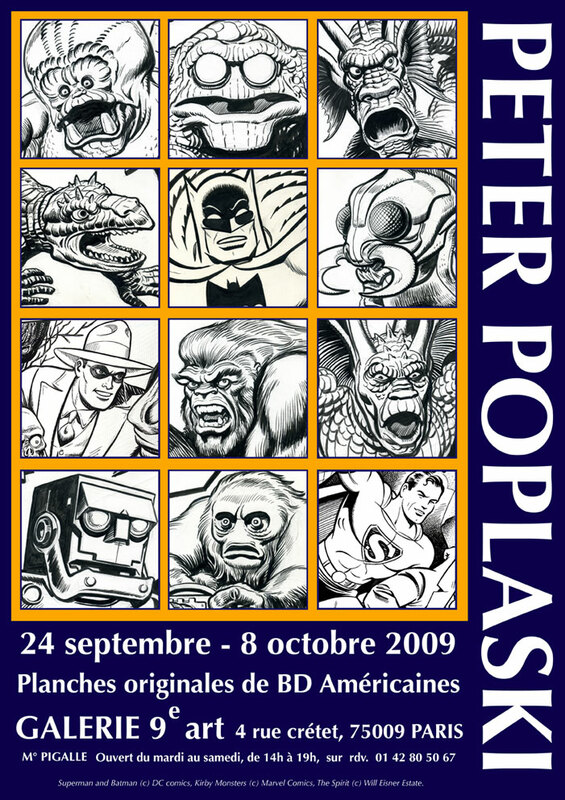 June till September, (du 6 juin au 21 septembre 2008). 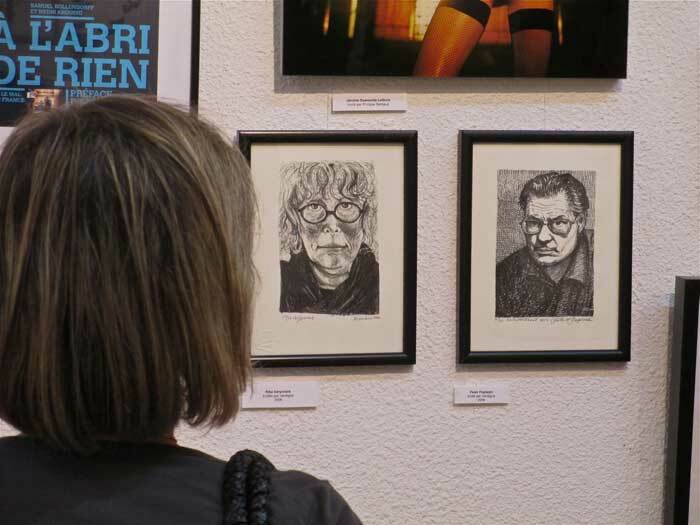 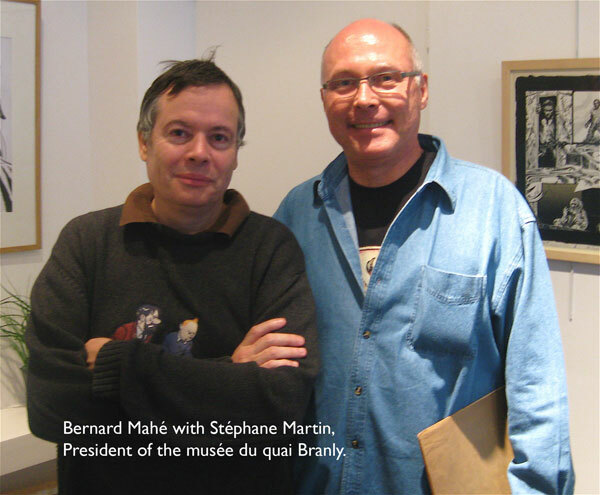 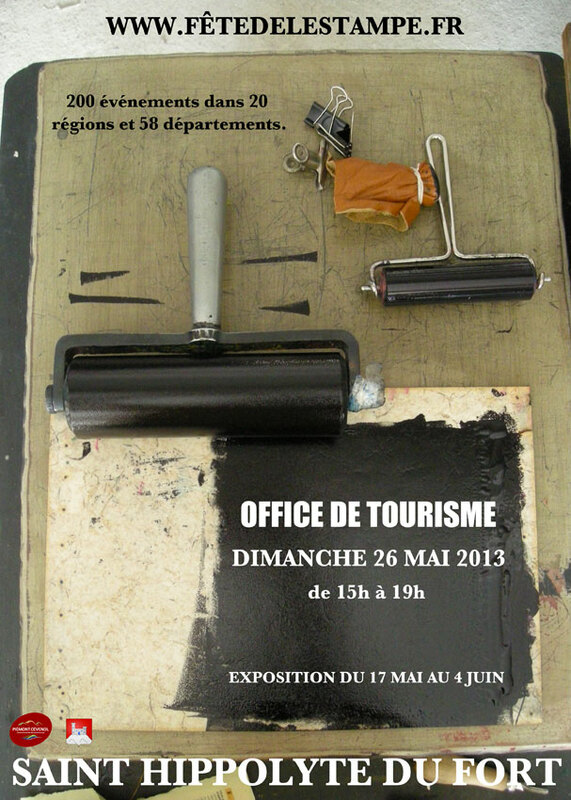 Deux artistes peintres exposent leurs regards, Salle d'exposition de l'Office de Tourisme de Saint Hippolyte du Fort, France. 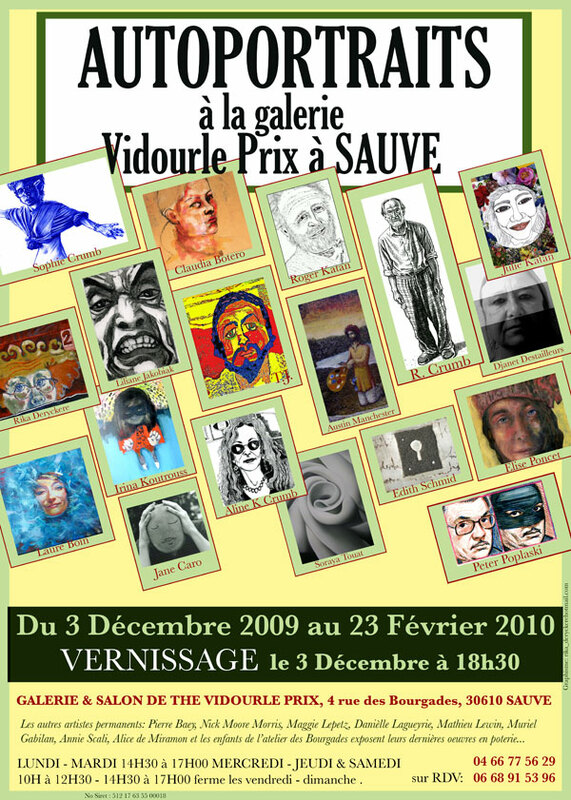 Festival de Cinéma et de la BD de Clermont l'Hérault January 2009.
with french comic artist CASA. 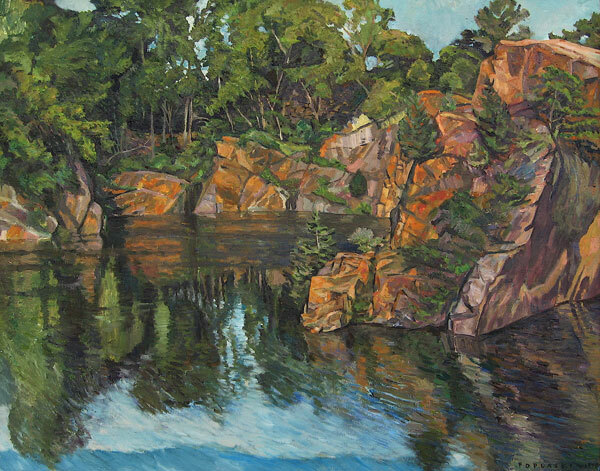 Bethany Luthern College, Mankato, Minnesota, USA. 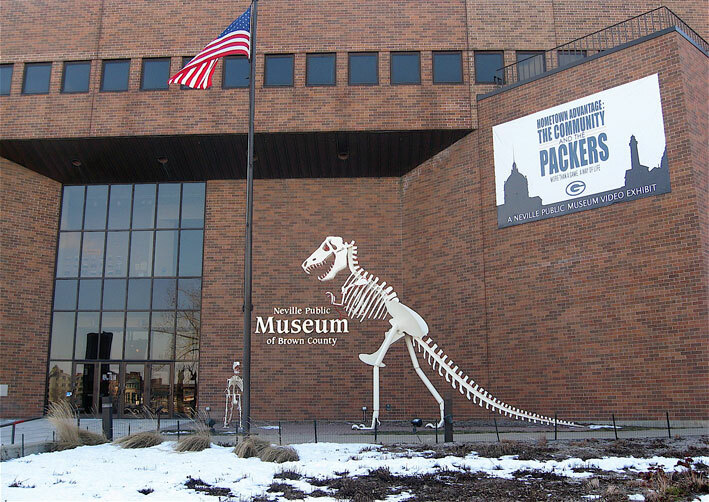 The University of Wisconsin, Madison.USA. 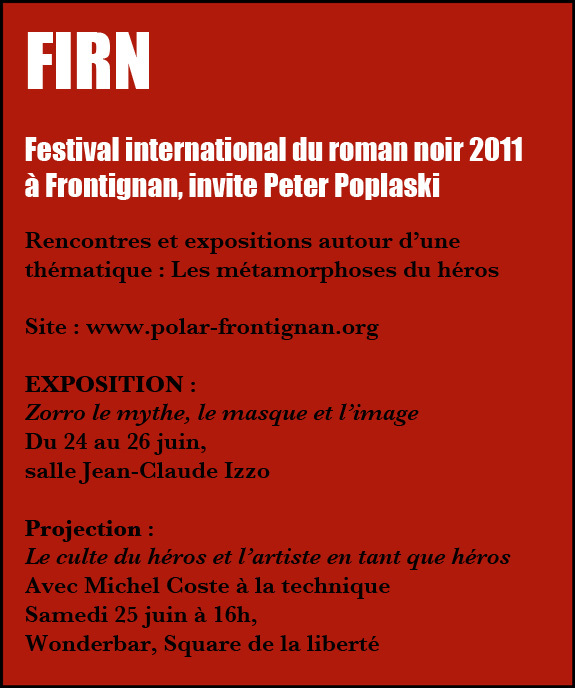 Musée du Quai Branly, 15 juin - 27 septembre 2009. 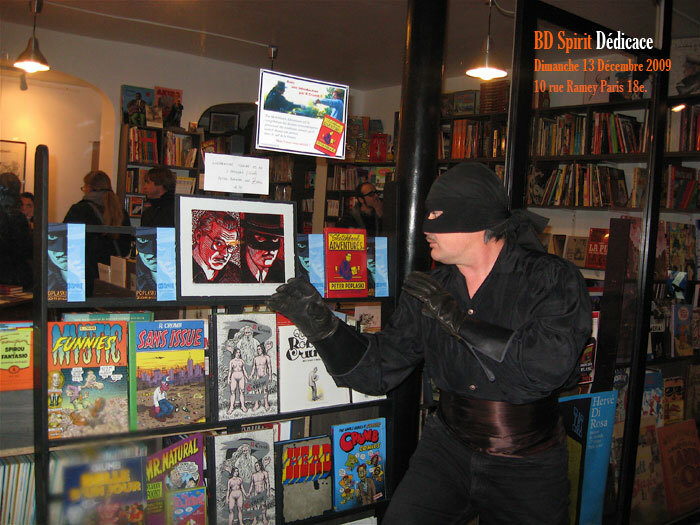 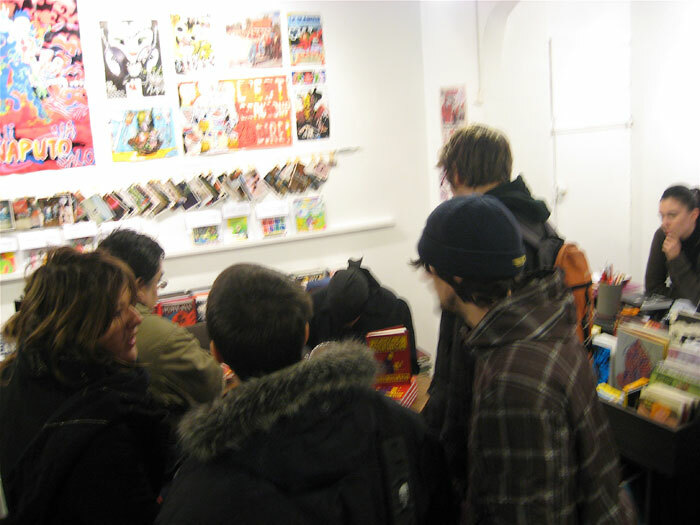 PARIS booksigning at BD Spirit !! 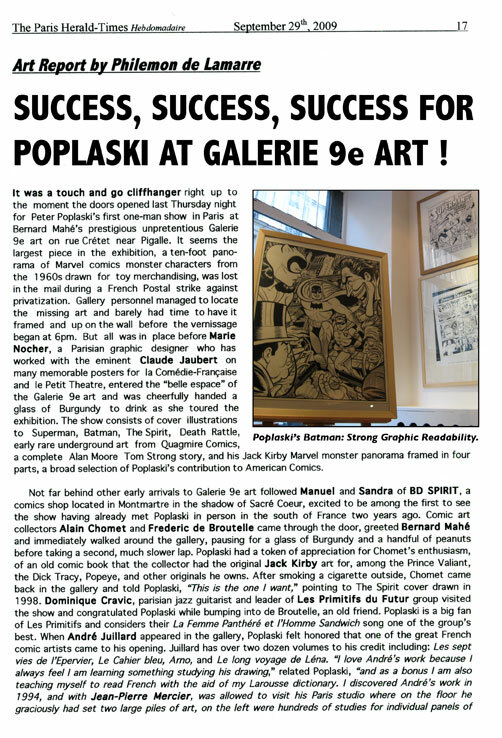 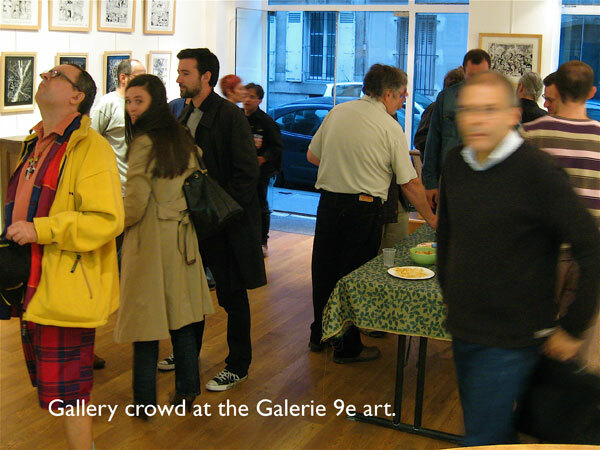 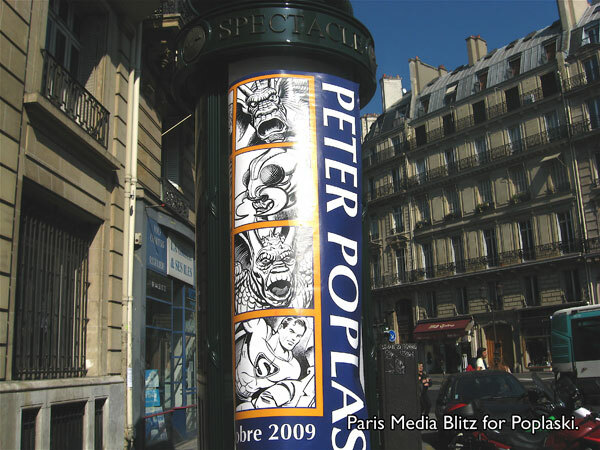 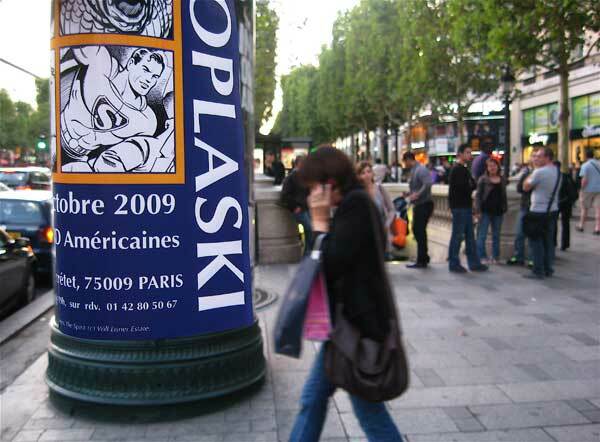 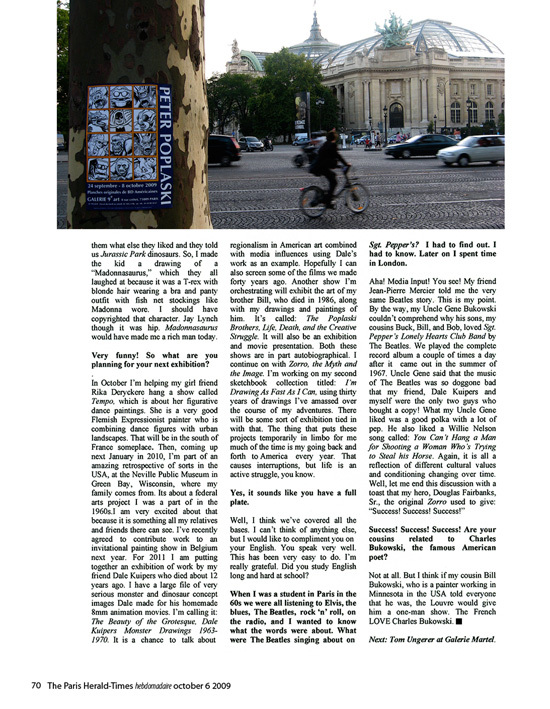 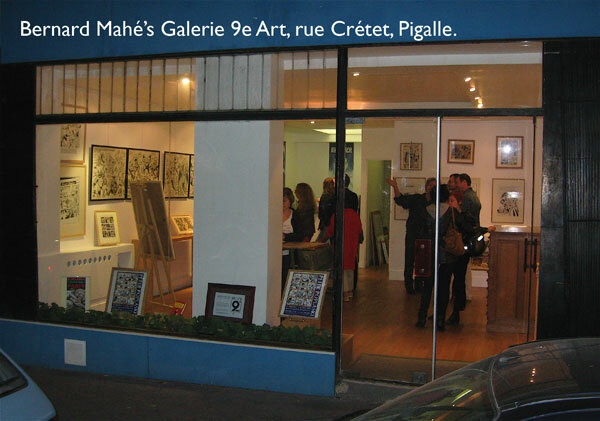 Artist Peter Poplaski finished a cartoon that is ten feet long for his exhibition at Bernard Mahe’s Galerie 9e art located in Pigalle in Paris, France, which ran from September 24th to October 8th, 2009. 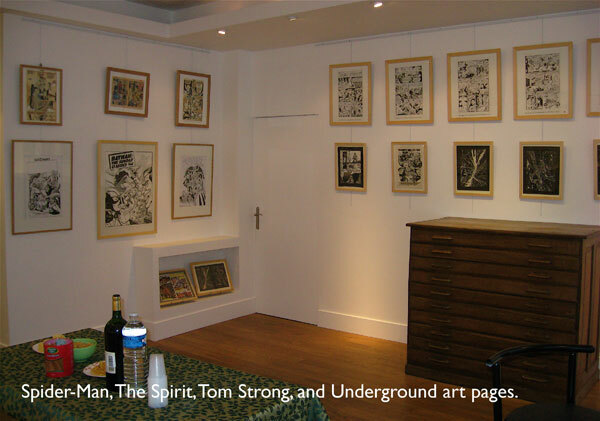 This show is like a retrospective with examples of cartoon art from all periods of Poplaski’s diverse career: 1970s underground, 1980s Marvel, covers for Death Rattle, The New Adventures of The Spirit, Superman: The Sunday Classics, Batman: the Sunday Classics newspaper comic-strip collections for DC Comics, Tom Strong pages, but a 10 foot cartoon of Marvel monsters from 1961, what’s that about? 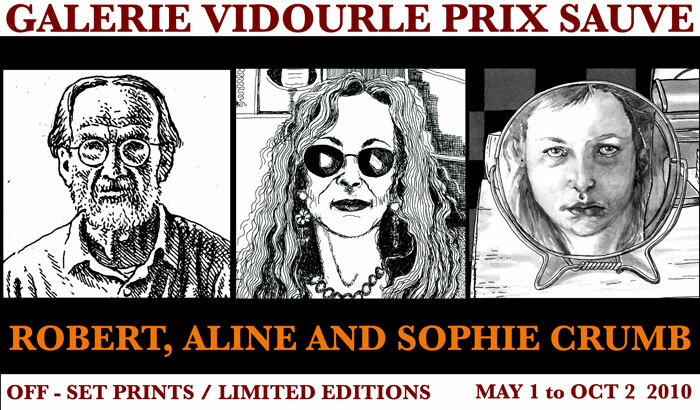 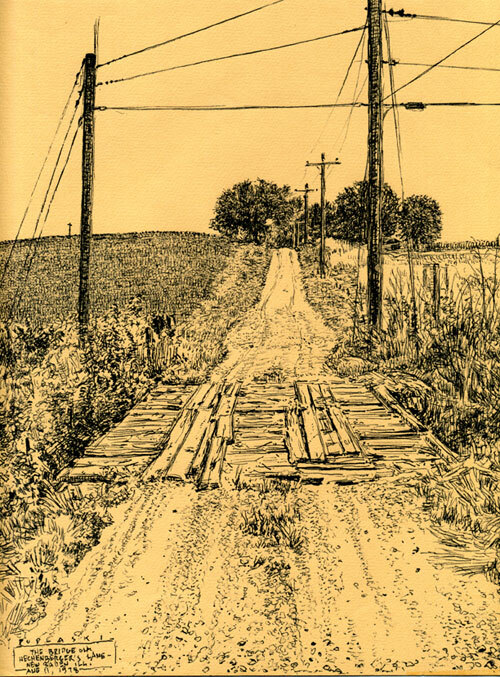 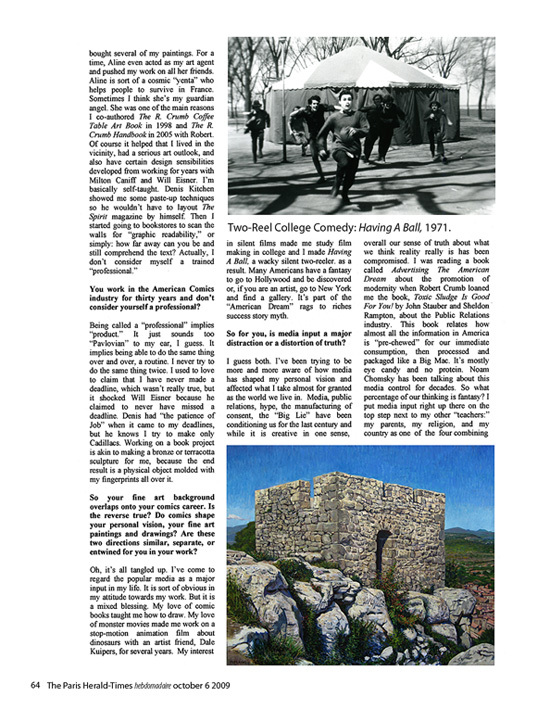 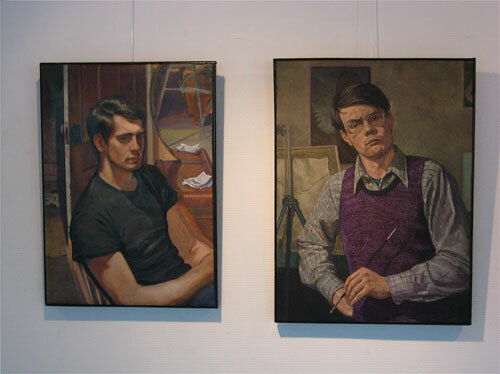 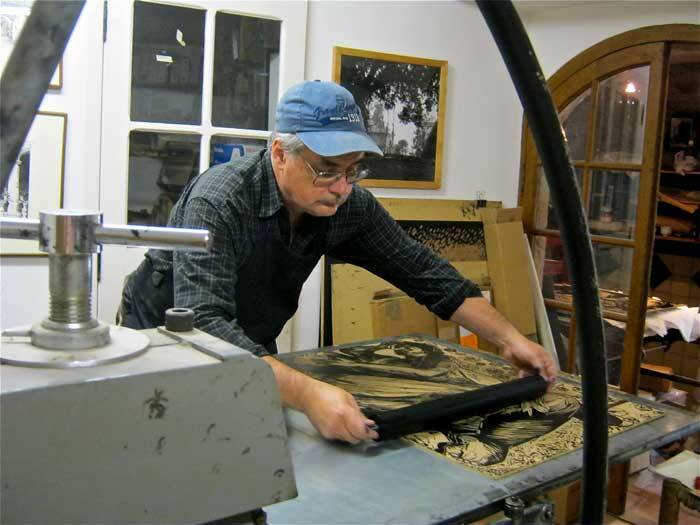 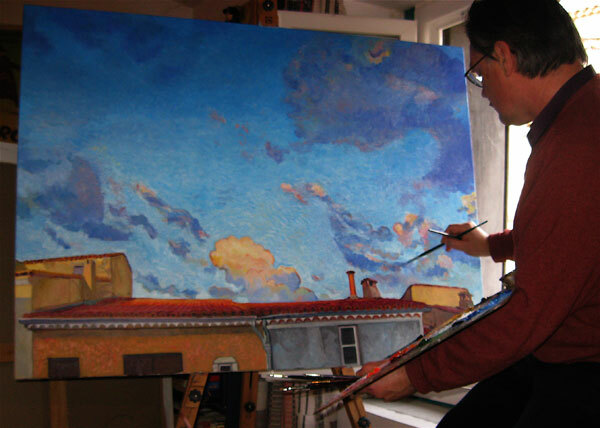 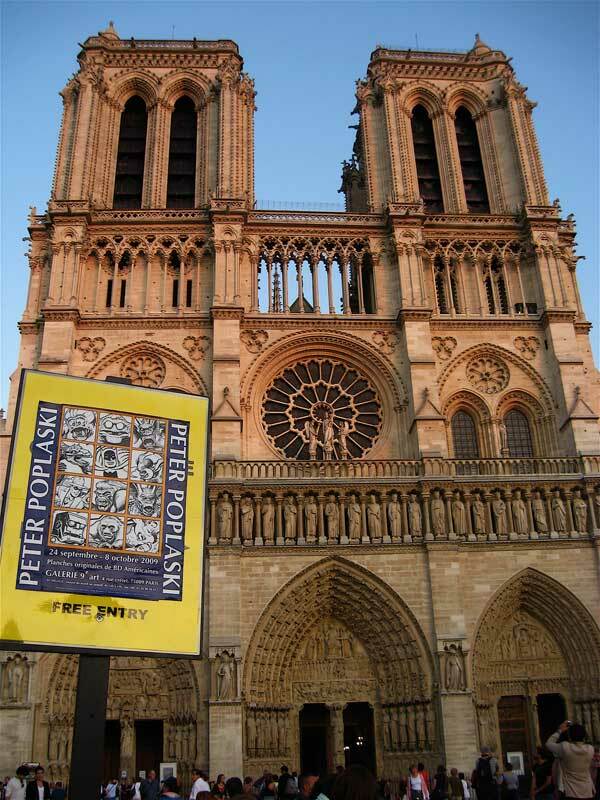 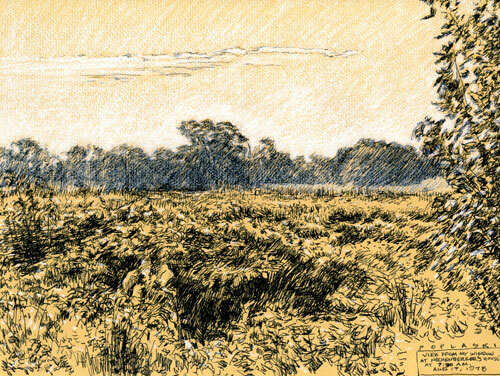 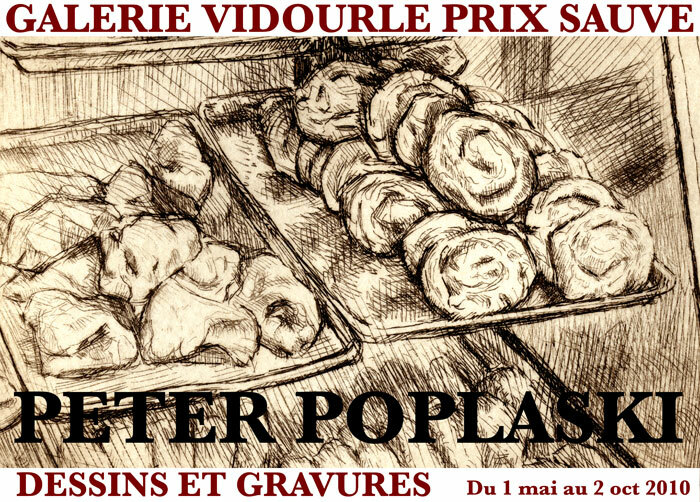 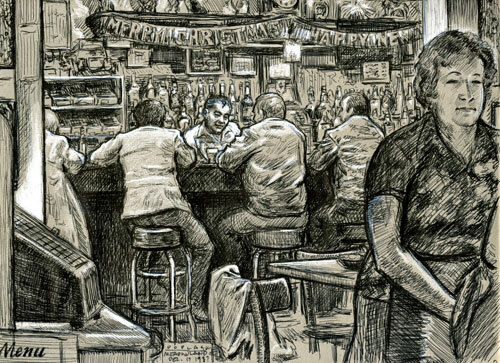 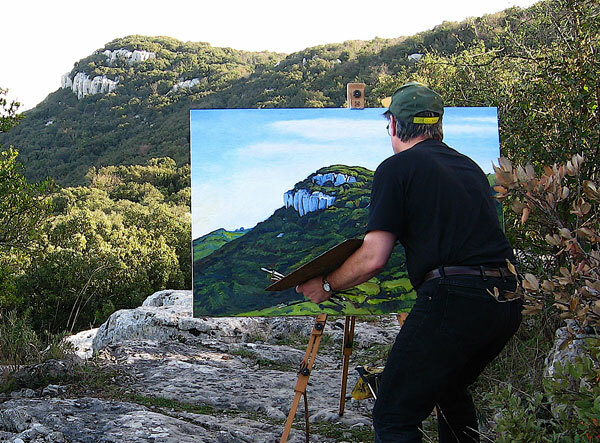 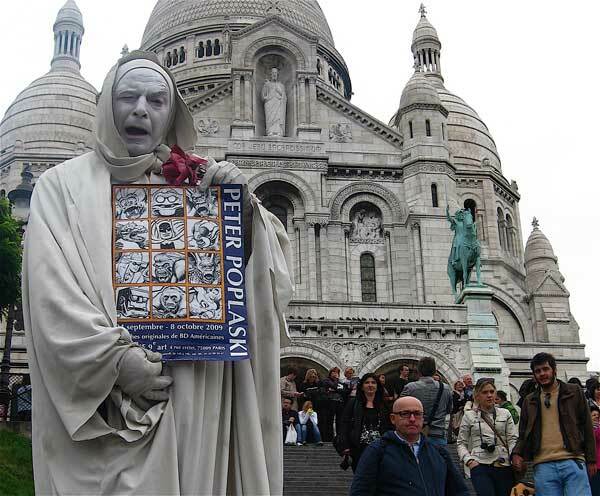 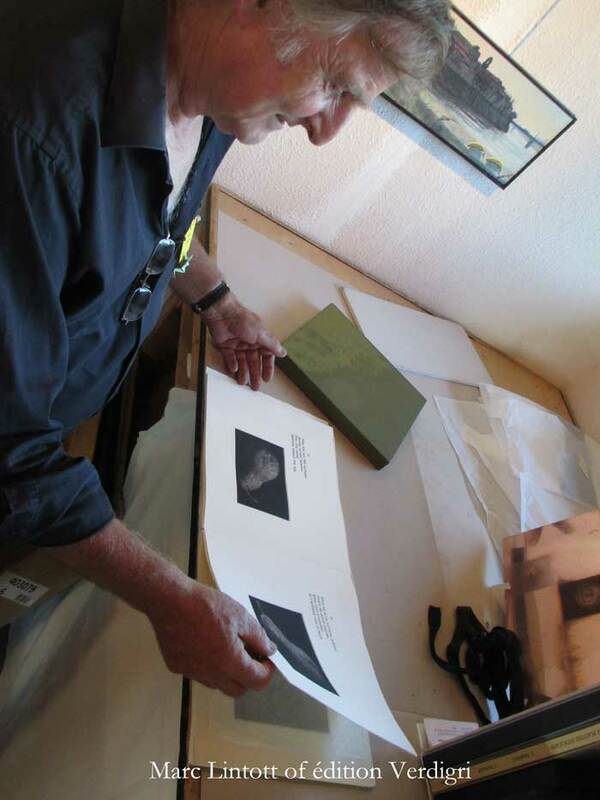 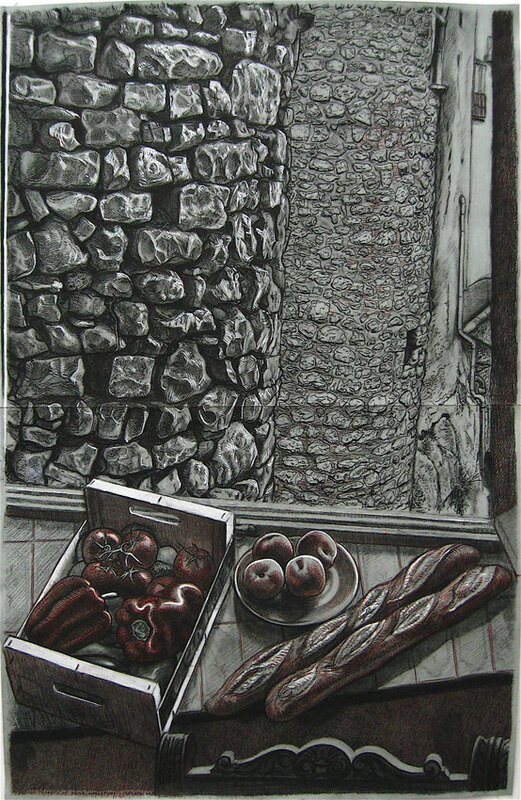 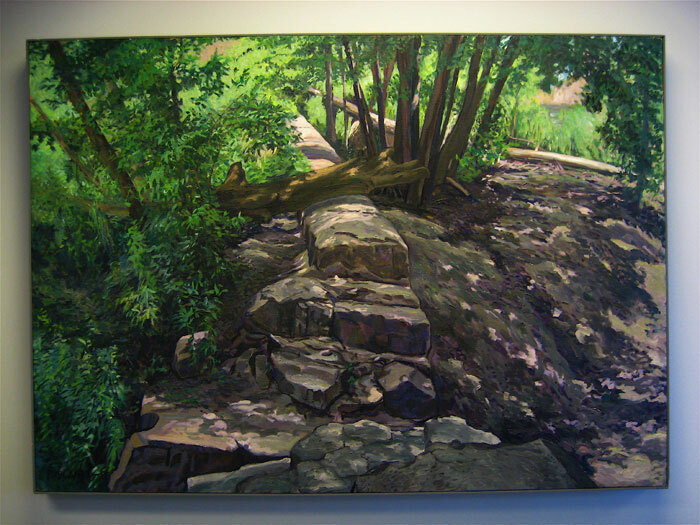 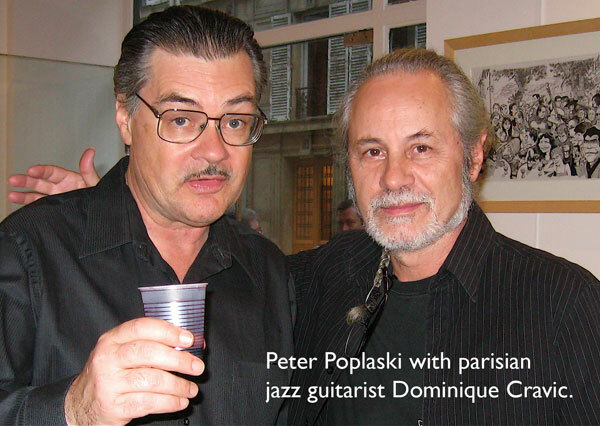 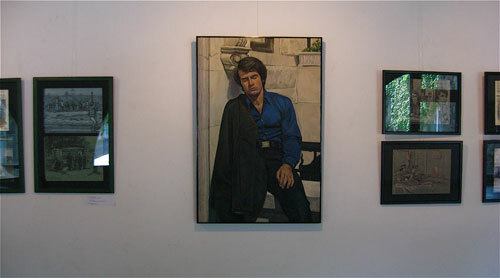 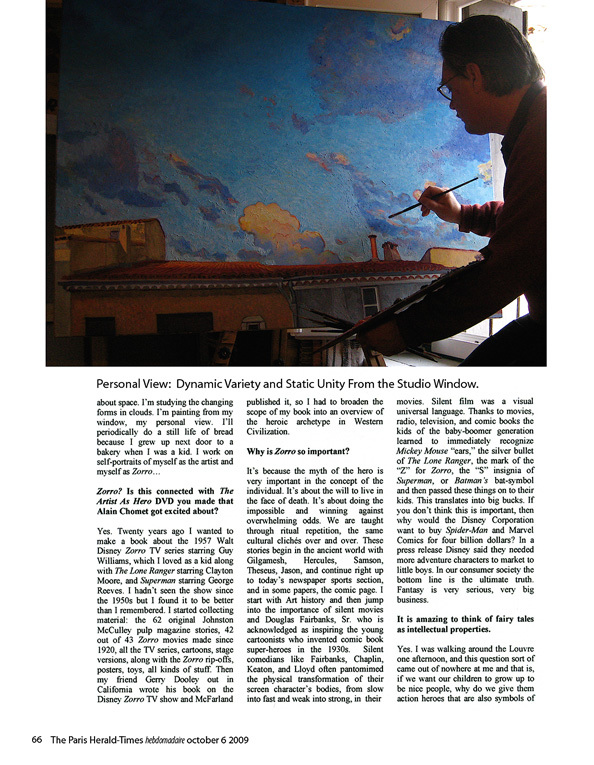 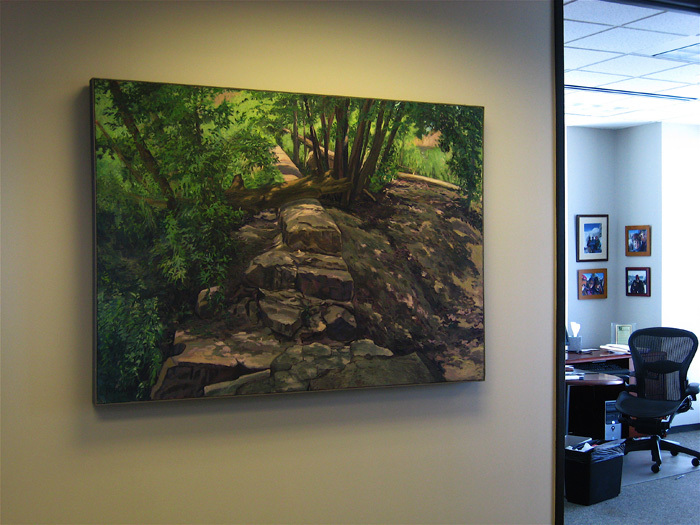 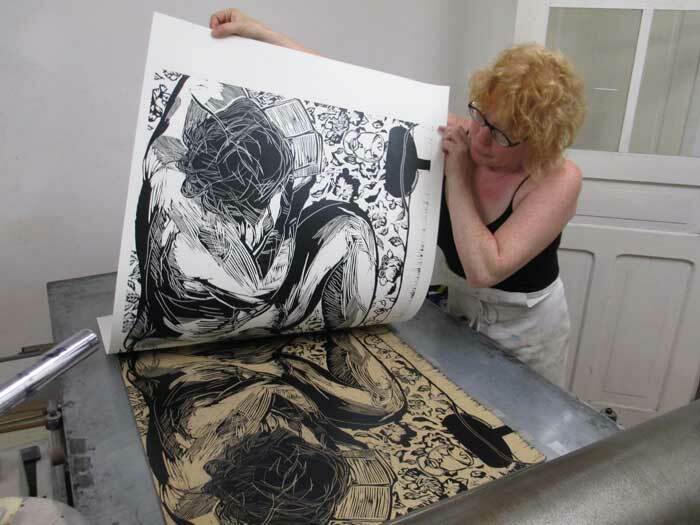 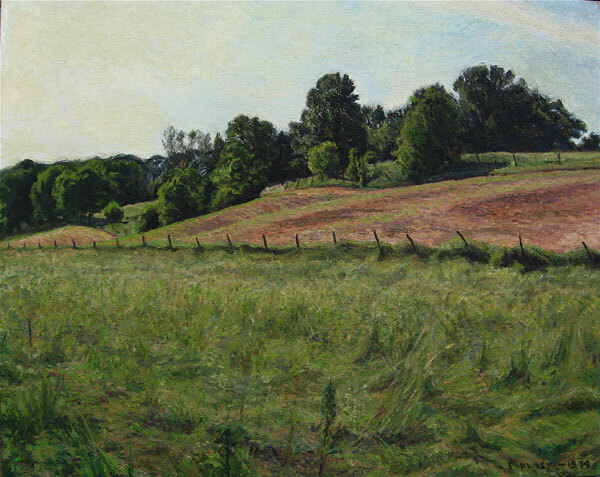 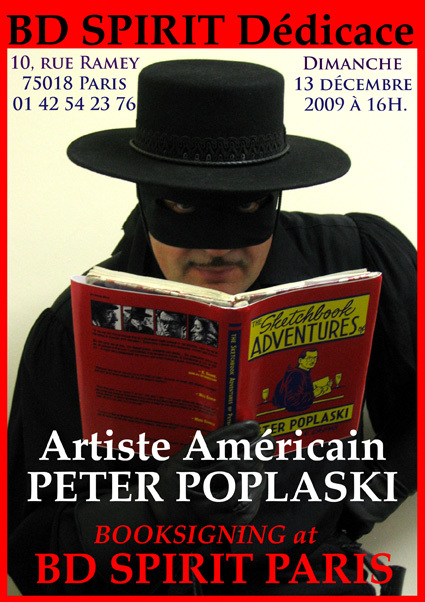 Peter Poplaski is painting and drawing in Wisconsin and the south of France. 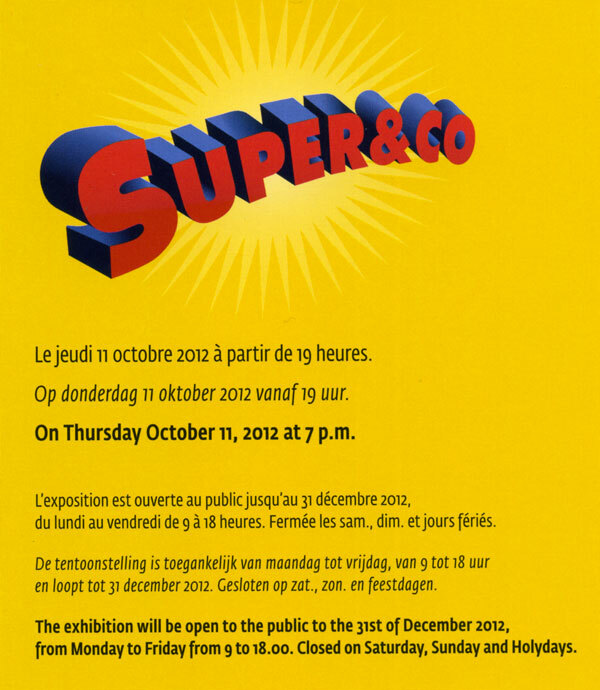 Right now he is participating in the exhibition TARZAN! 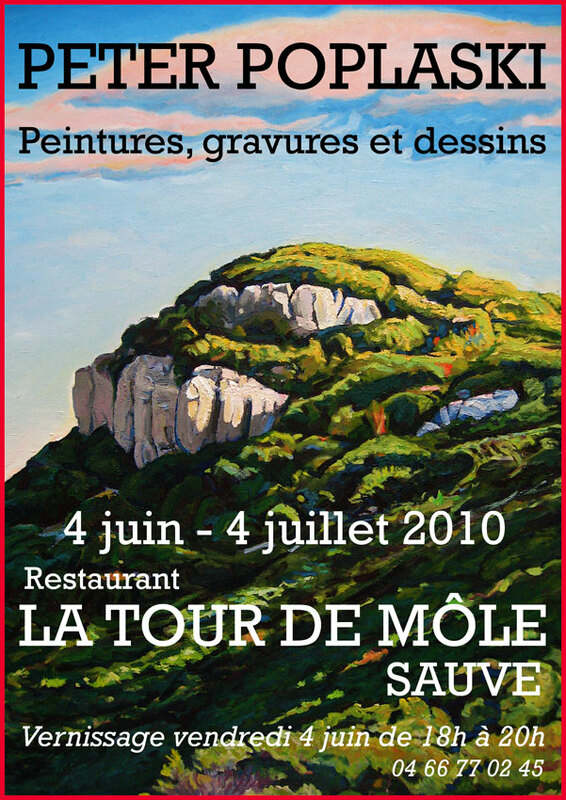 Ou Rousseau chez les Waziri, from June 16 to September 27, 2009 at the musée du quai Branly in Paris. 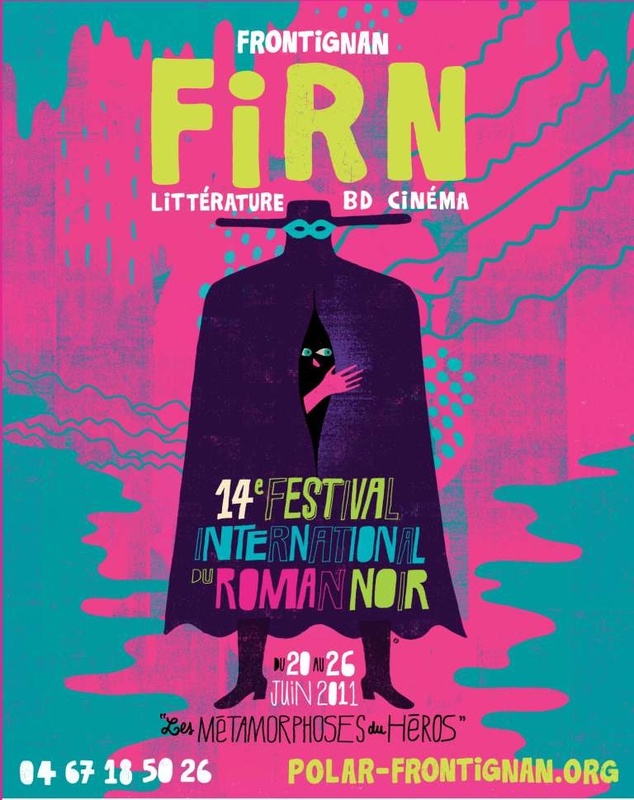 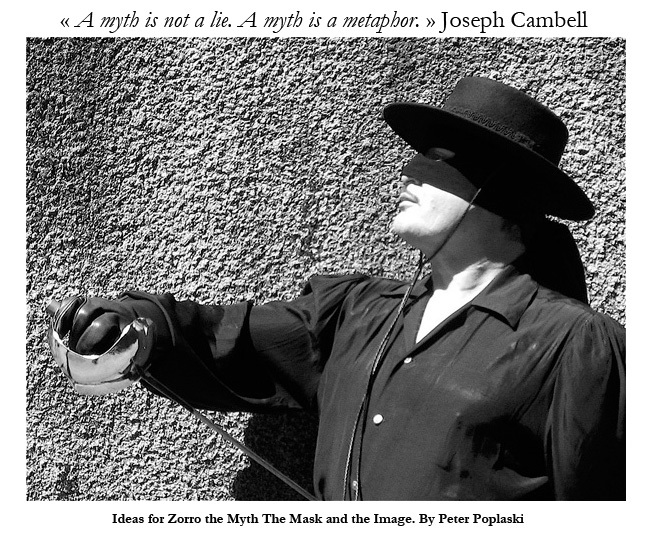 He is currently developing I’m Drawing As Fast As I Can, his second collection of sketchbook drawings and Zorro: the Myth and the Image, a book about media and the heroic archetype in western civilization. 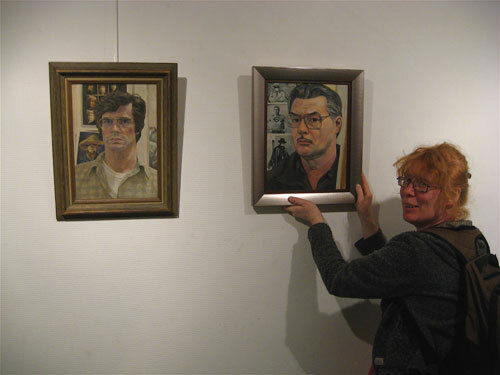 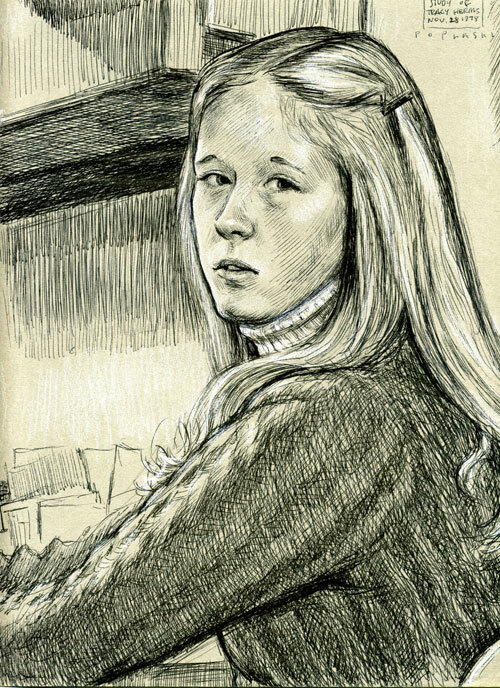 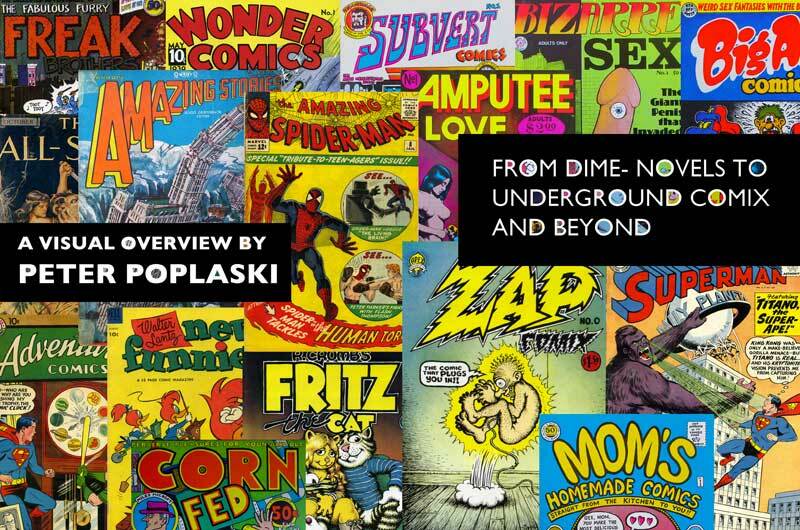 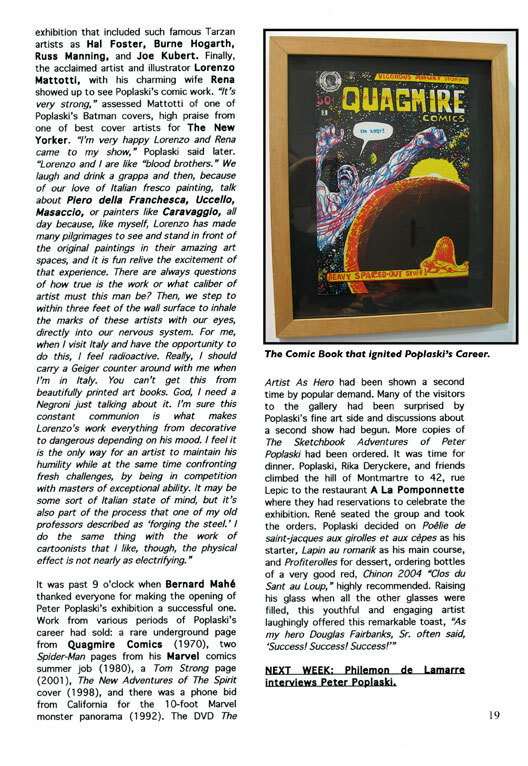 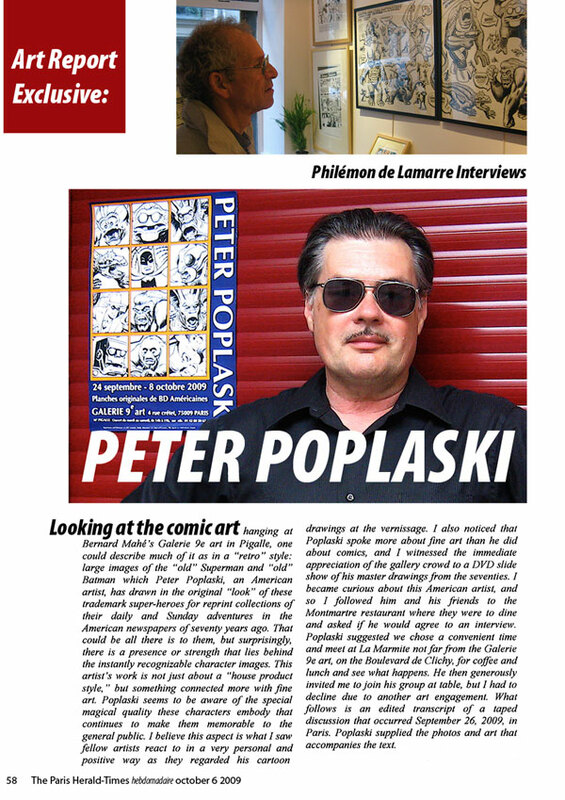 Peter Poplaski is an artist who has dabbed in the American comic industry, beginning in 1970 with the Underground Comix scene, and then mostly as freelancer for Kitchen Sink Press, Marvel, and DC Comics, while also following a career as a painter, participating in many exhibitions. 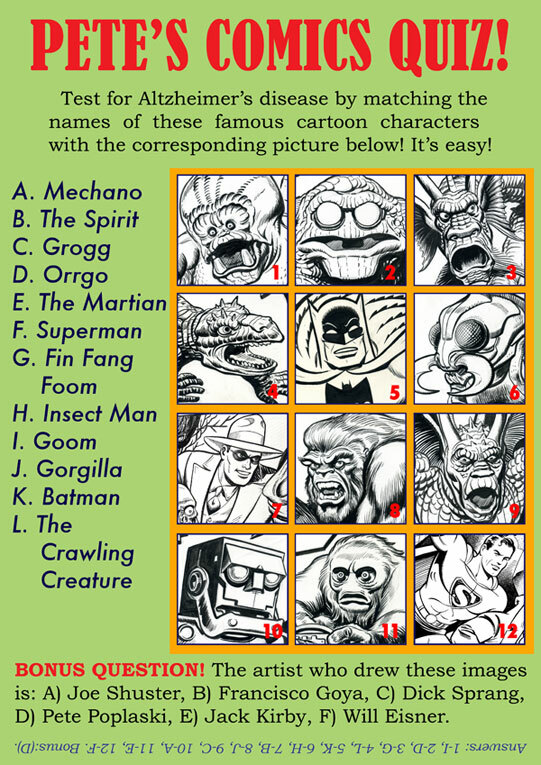 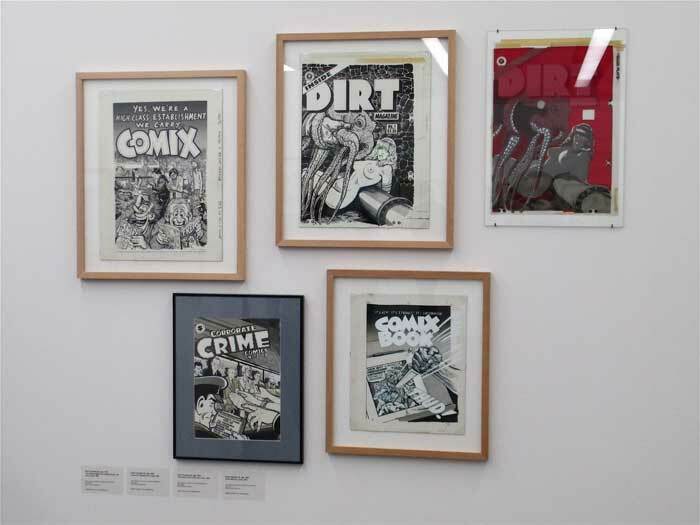 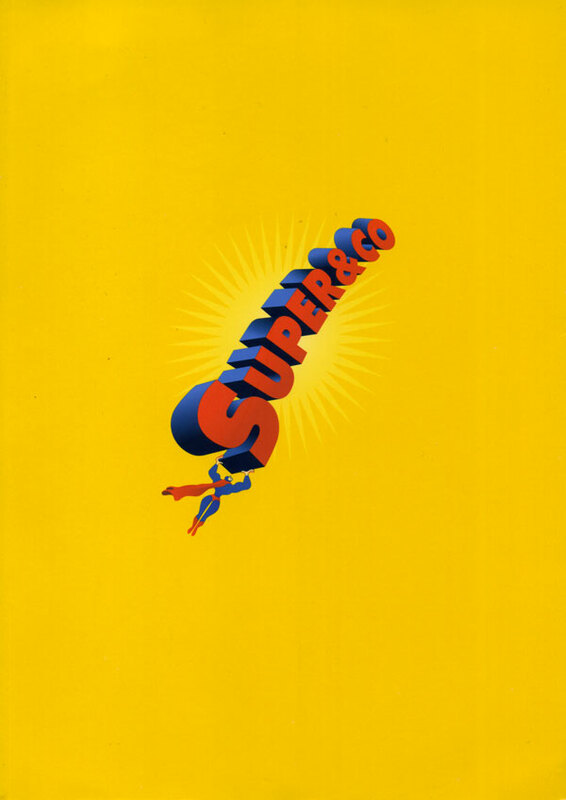 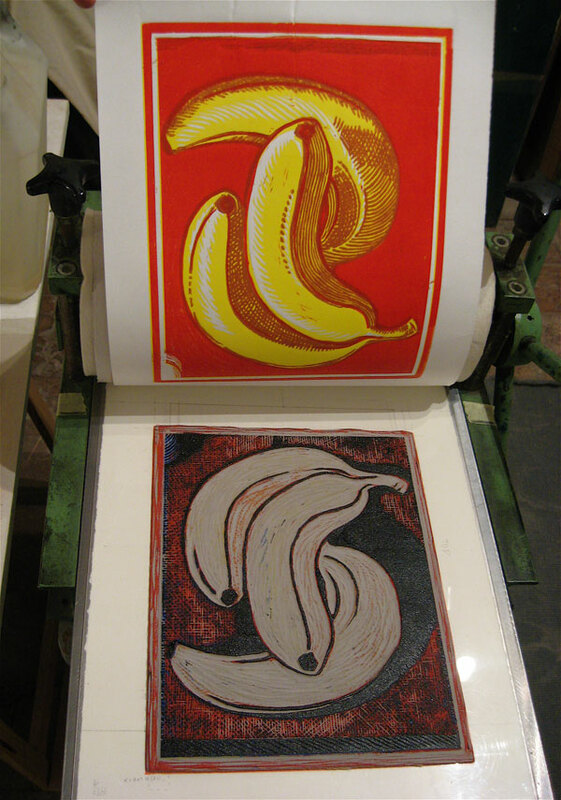 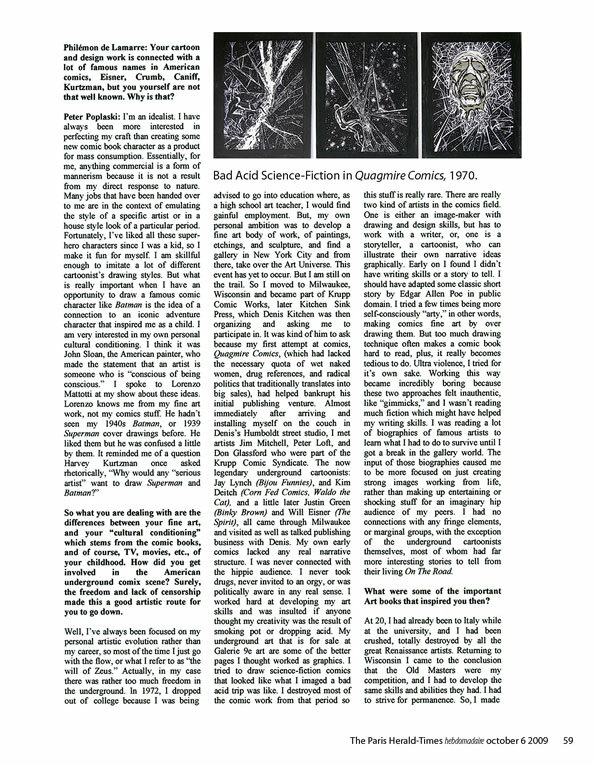 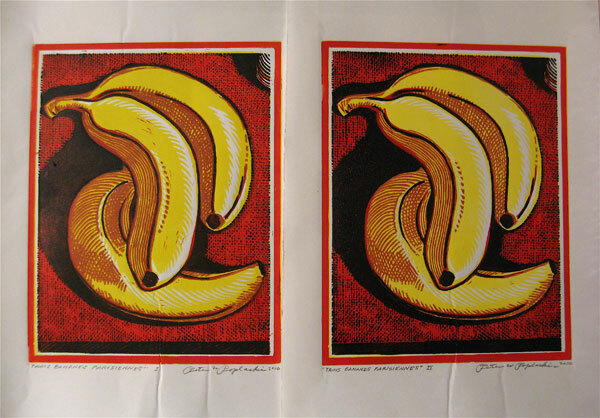 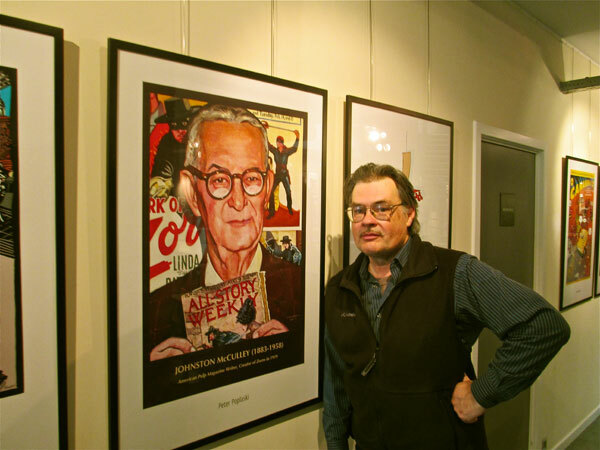 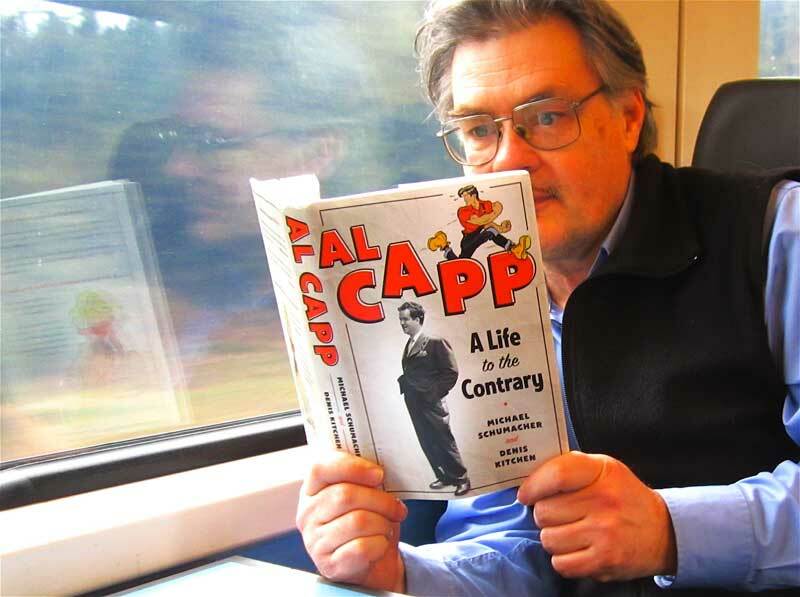 He has edited and designed numerous awardwinning newspaper strip reprint collections including Superman, Batman, Flash Gordon, Alley Oop, Li'l Abner and Steve Canyon. 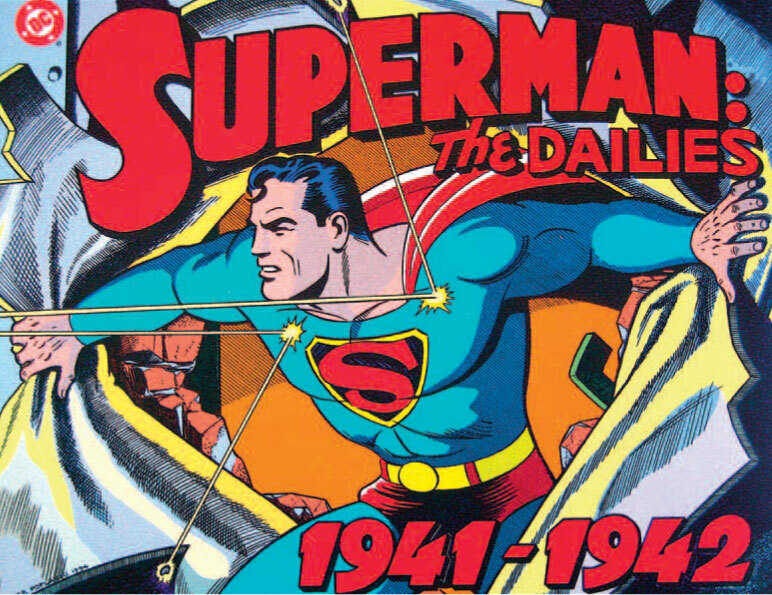 The covers he drew for the Batman and Superman Dailies and Sunday series are regarded by many as definitive. 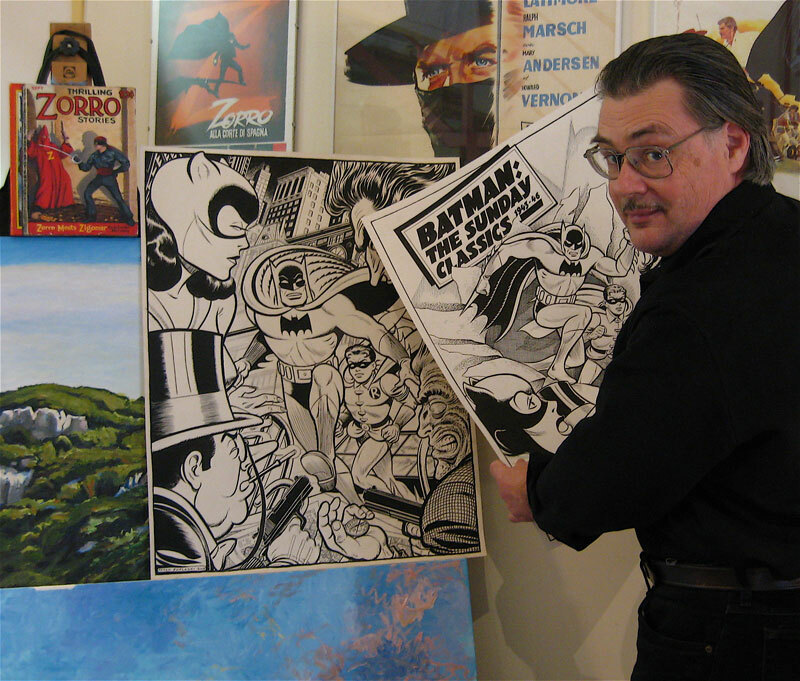 He has worked closely wth such creators as Will Eisner, Milton Caniff, Harvey Kurtzman, Gil Kane, Alan Moore, and R.Crumb. 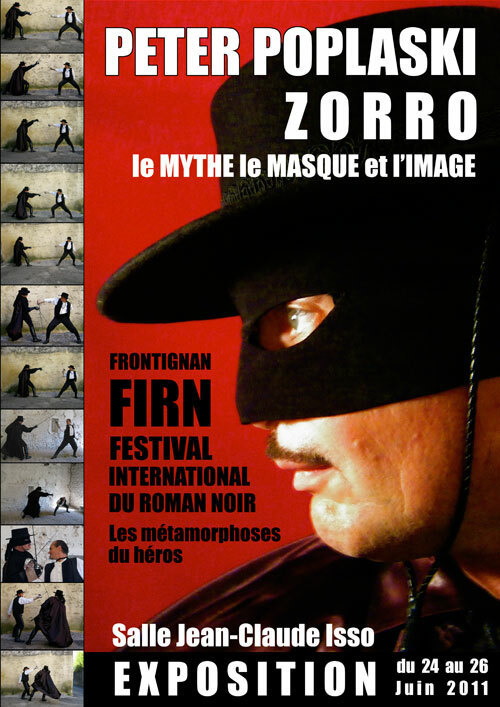 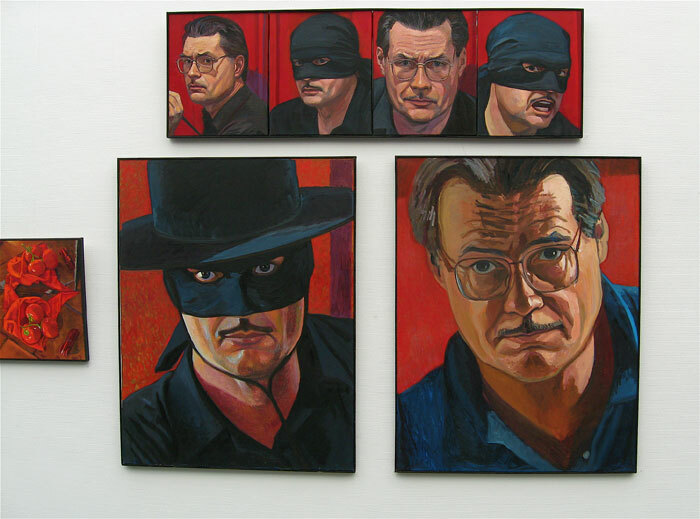 His ongoing challenge and obsession is finishing ZORRO: The Myth and the Image, a definitive study of the masked heroic archetype. 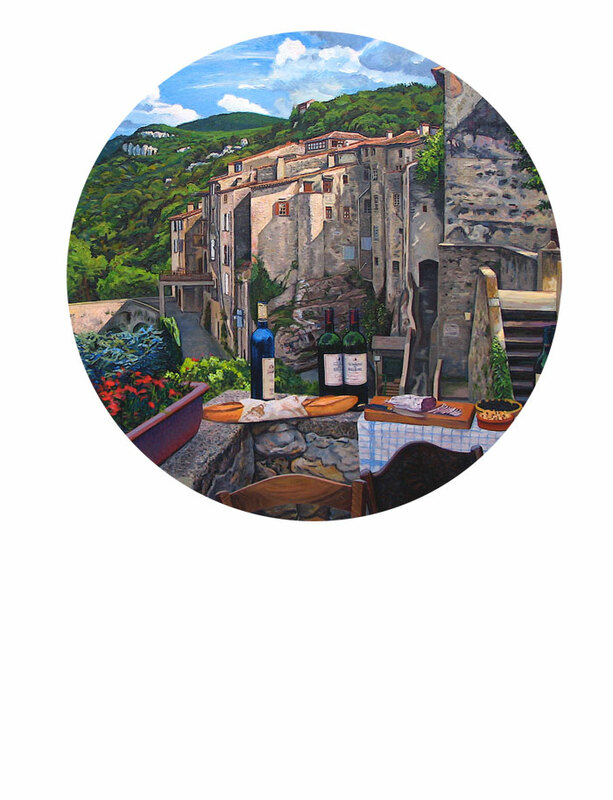 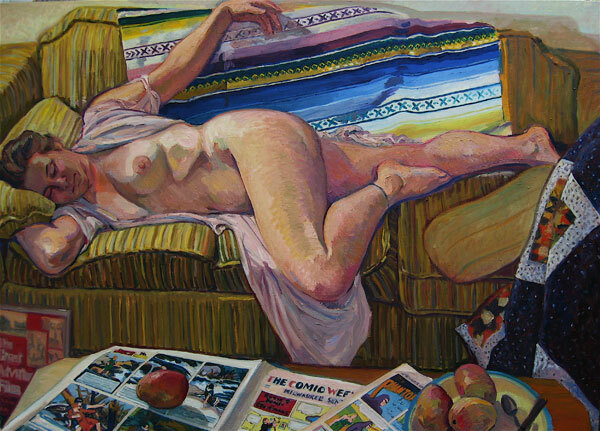 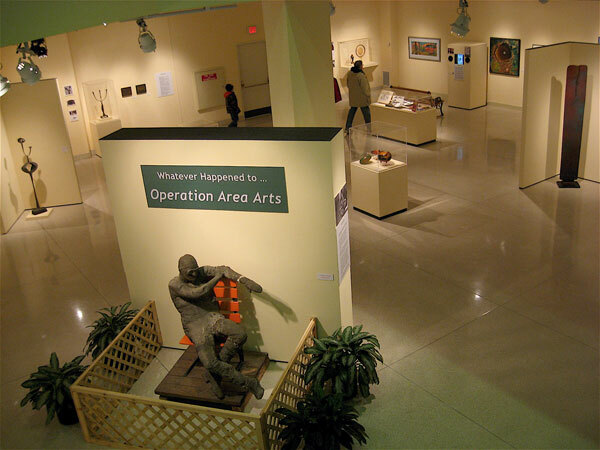 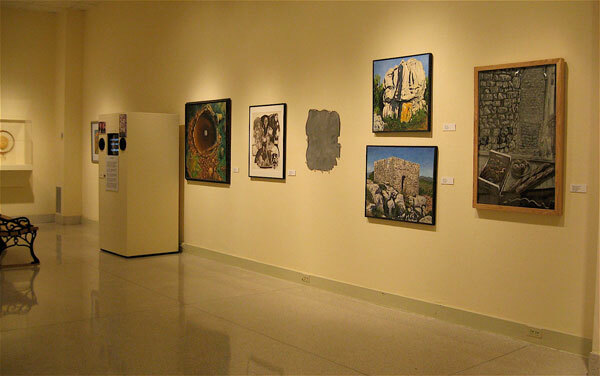 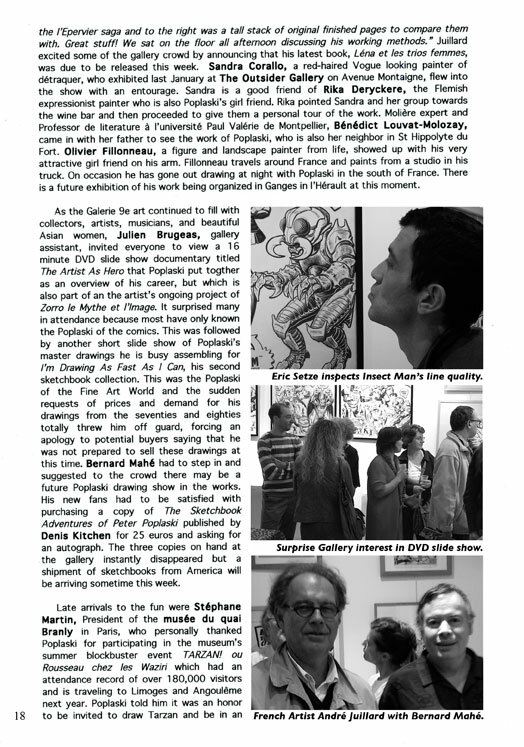 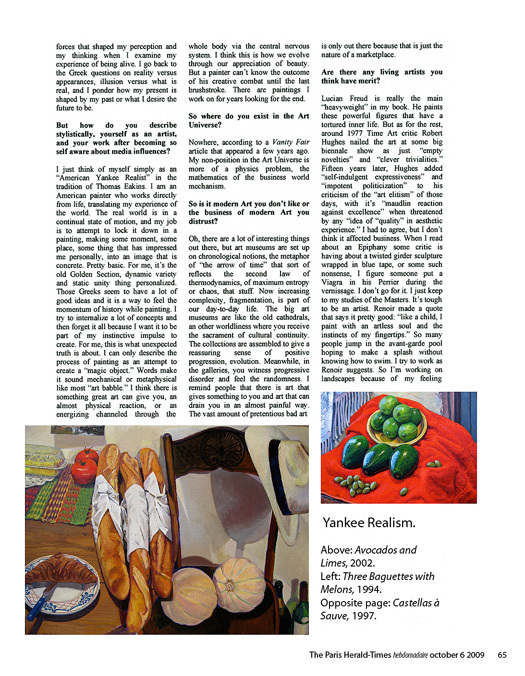 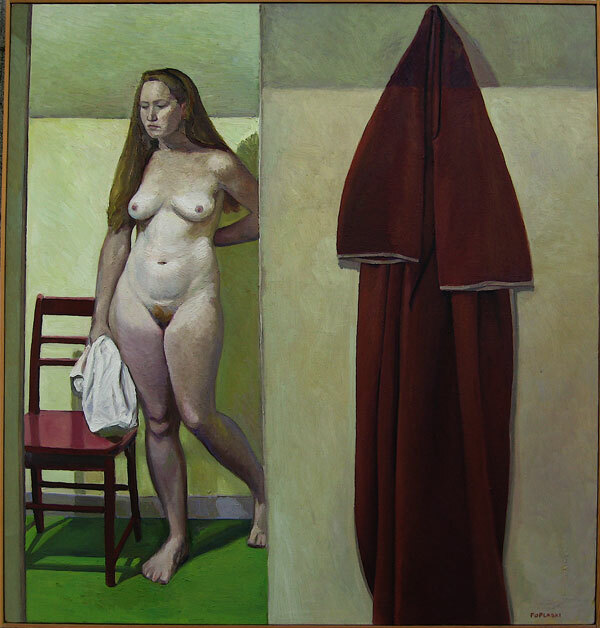 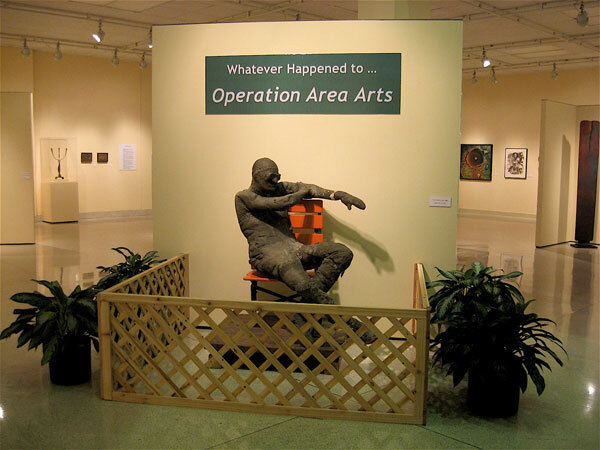 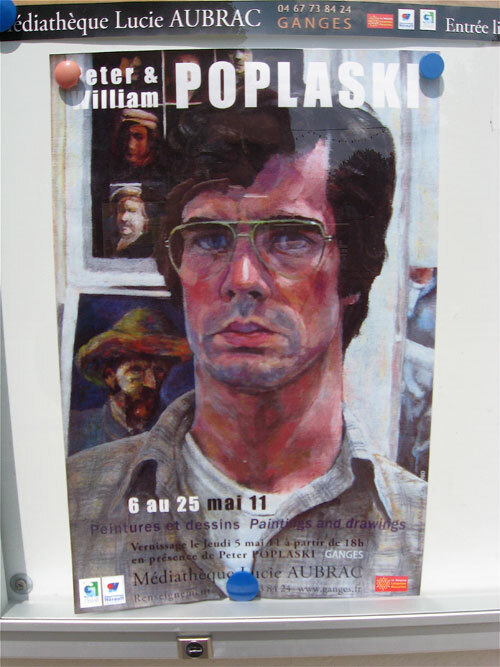 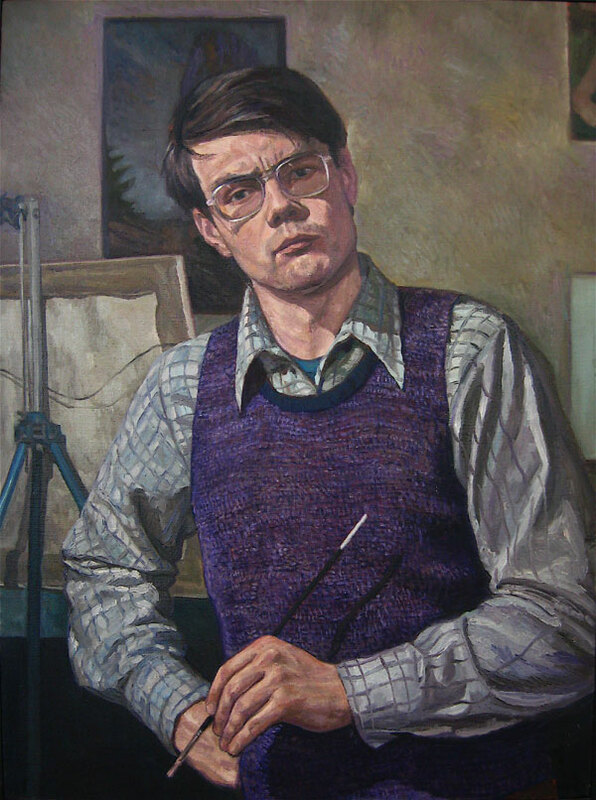 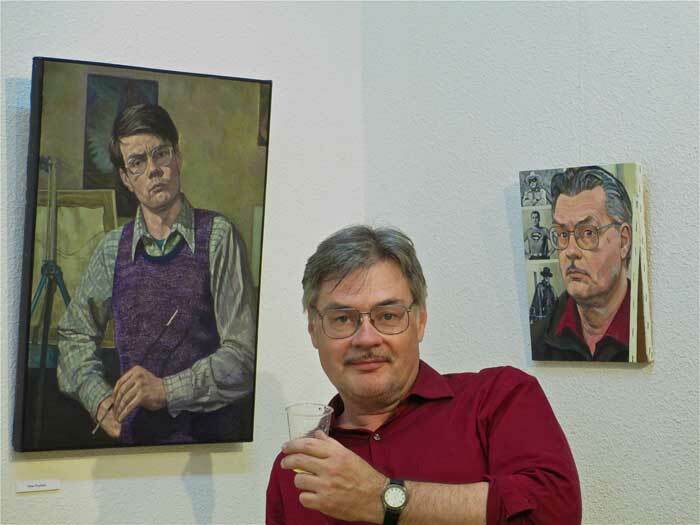 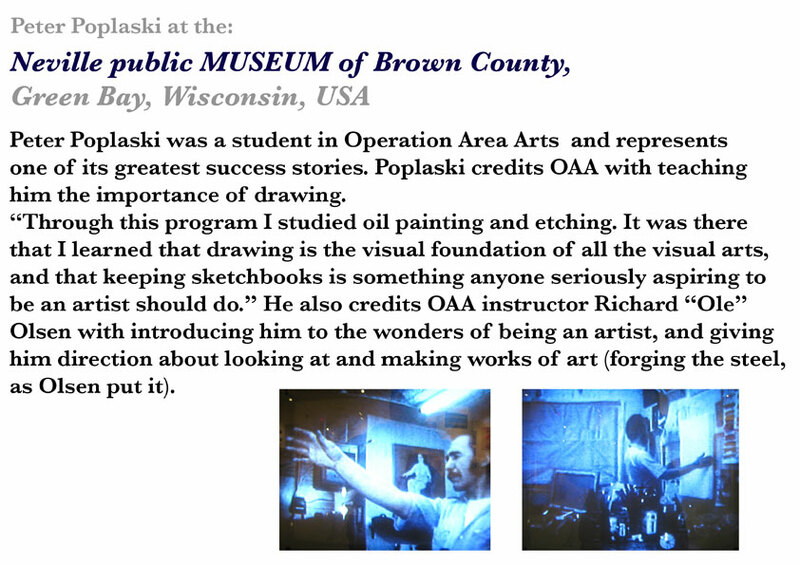 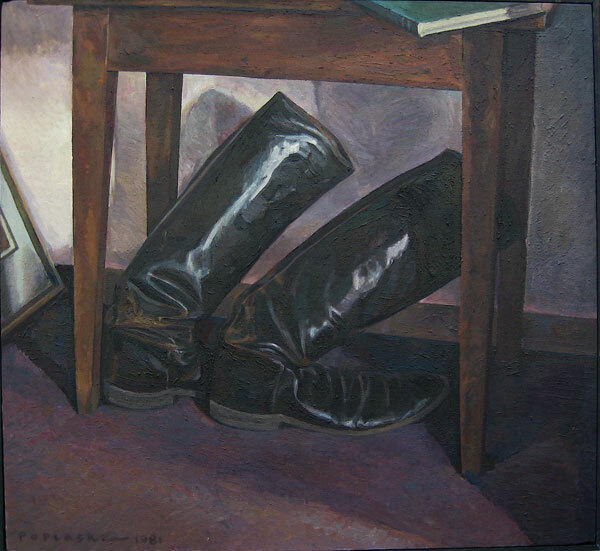 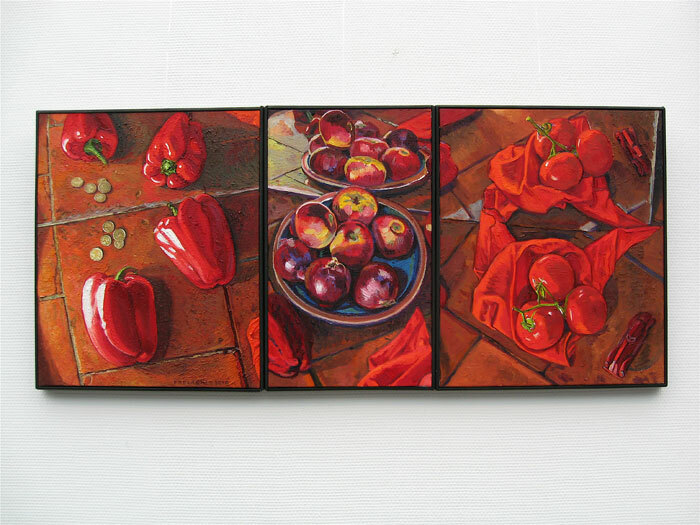 Peter Poplaski, originaire de Green bay dans le Wisconsin USA diplômée en art (1991), expose peintures et dessins créés en Europe et en USA. 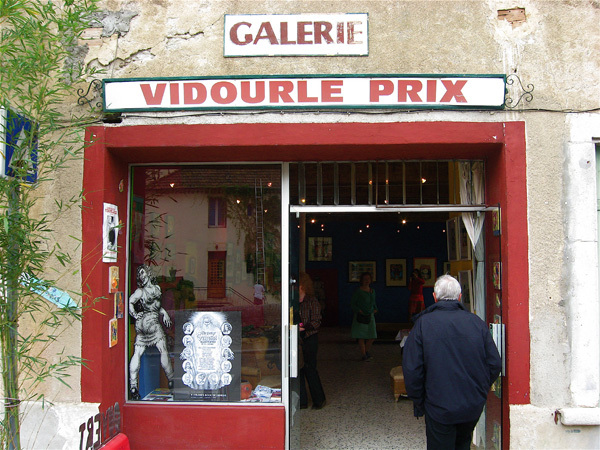 Il vie également dans le sud de la France depuis 1994. 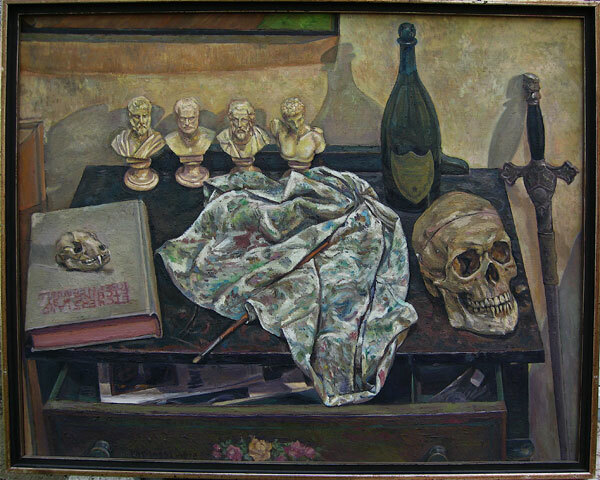 Son objective est de travailler tout genres: le paysage, la nature morte et le modèle.